We recently took our flyaway to Alaska for the first time in recent memory. 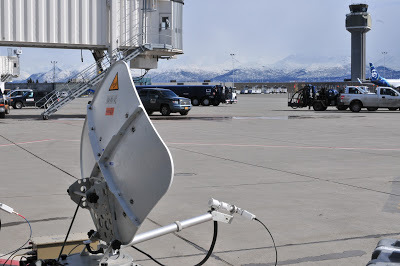 Operating here presents some challenges due to its location, although at our spot in Anchorage our look angles were not too low, about 18 degrees. 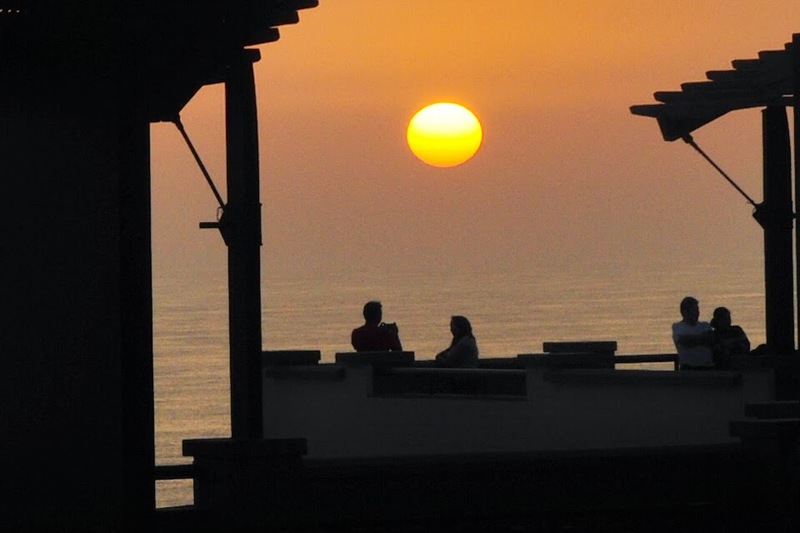 This is a good opportunity to discuss satellite beams, or coverage. 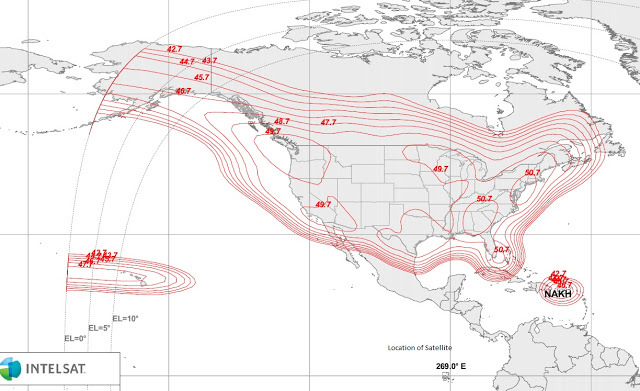 This map shows the beam of the satellite, the circles are the center of the beam, the strongest coverage. Each ring moving out from the “hot spot” gets progressively weaker, although the small differences within the main part of the beam are not noticeable. 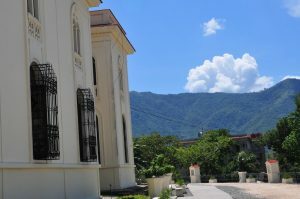 The satellite is physically located above the equator, where all communications satellites are, at a distance of about 22,000 miles up. 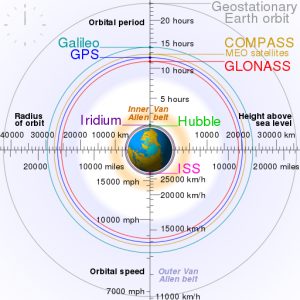 This highest orbit allows the satellites to move with the earth, and remain in a fixed position in the sky as viewed from ground, as opposed to satellite networks such as GPS and Iridium which are much lower and constantly move across the sky. 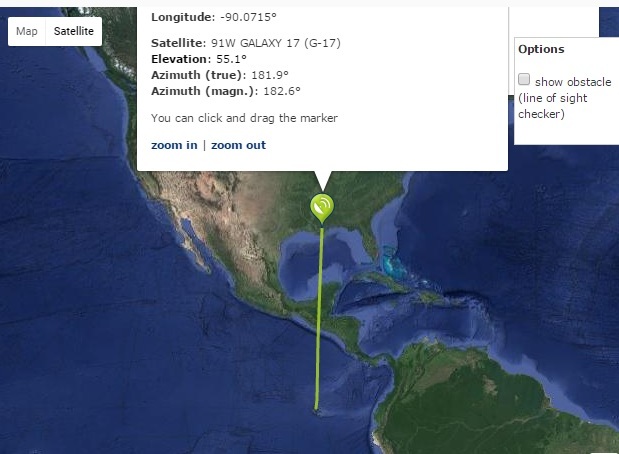 Galaxy 17’s location above the equator is 91 degrees west (or 269 degrees east, depending on where you start from), or basically due south of New Orleans. A dish in New Orleans would look almost due south, at an elevation of 55 degrees. If you then went further south from there into the southern Hemisphere, since the equator is north of you, so would the dish pointing, and the elevation angle would decrease as you continued further south, just like it did going north. 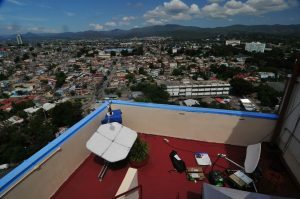 A high angle dish covering the earthquake in Ecuador. 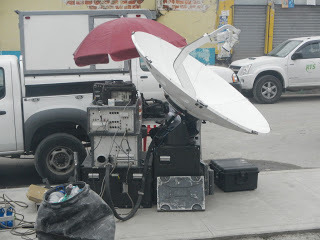 This satellite is toward the west, otherwise the dish would be even higher. However, since the satellite has limited power, it has to be focused in “beams” to be effective. 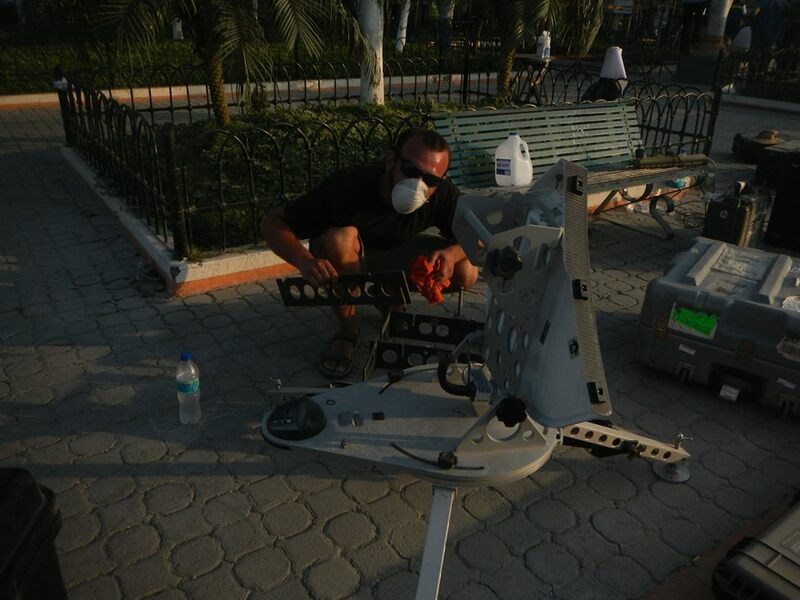 So even though you could physically “see” Galaxy 17 from the Galapagos (with a giant telescope! 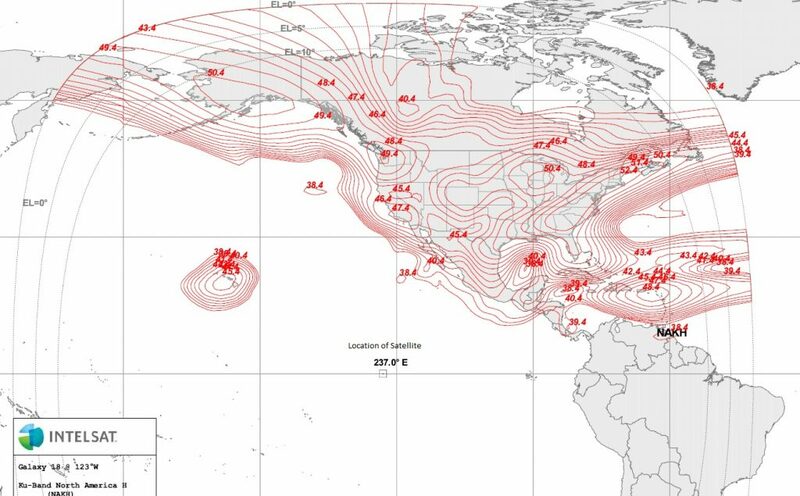 ), the radio frequency energy is not directed in that area, so the satellite would not be usable, as you can see in the coverage map above. It would be like a flashlight pointed away from you. 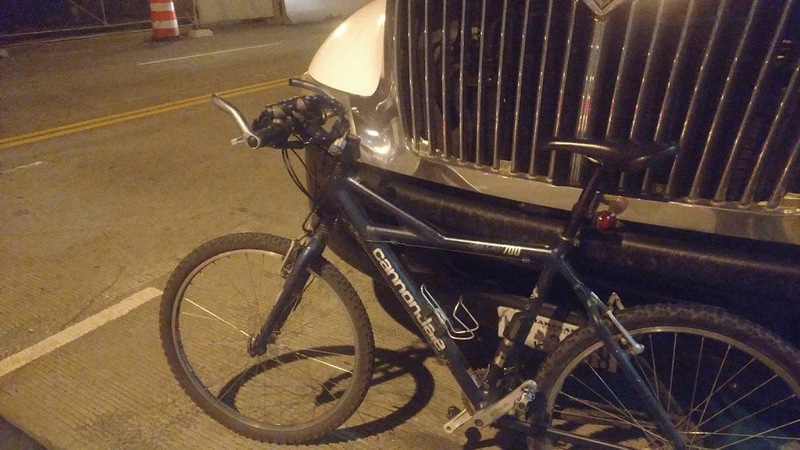 You could see the flashlight itself, but not any of the light coming from it. 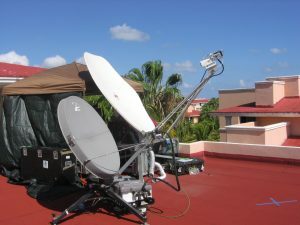 Being a satellite made for the American market, you can see the engineers designed Galaxy 17 to have two “spot beams” (small, focused areas of coverage separate from the main beam) over Hawaii and Puerto Rico. You can see on the coverage map how close the lines are to each other, showing a steep gradient from good coverage to zero coverage. 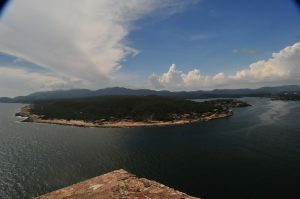 On the western edge of the chart are three lines, showing 10 degrees, 5 degrees, and 0 degrees, the point where the satellite disappears beyond the horizon. 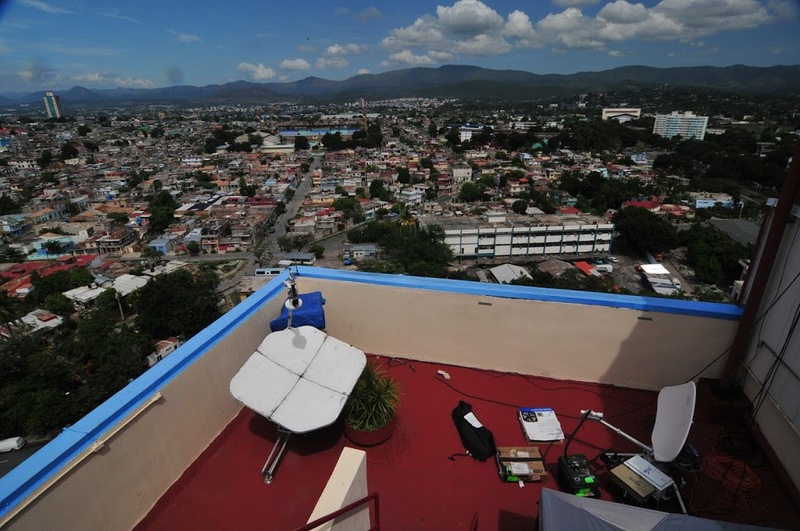 As viewed from Anchorage, Galaxy 17 is only 5 degrees above the horizon, which is not easily usable unless the antenna is mounted on a rooftop without any nearby obstructions. 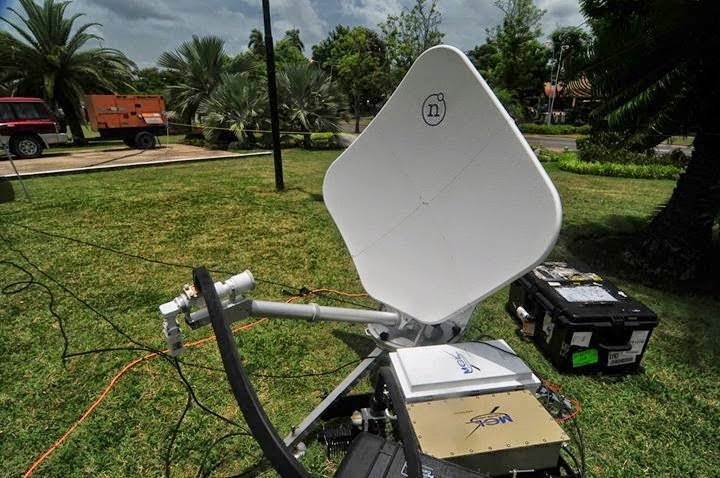 It also has weak coverage, meaning a larger dish and/or more power would be required. 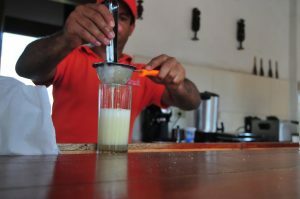 A 1.2 meter flyaway next to a 2.4m flyaway. Or about 100 pounds in two cases vs 1100 pounds in ten cases. 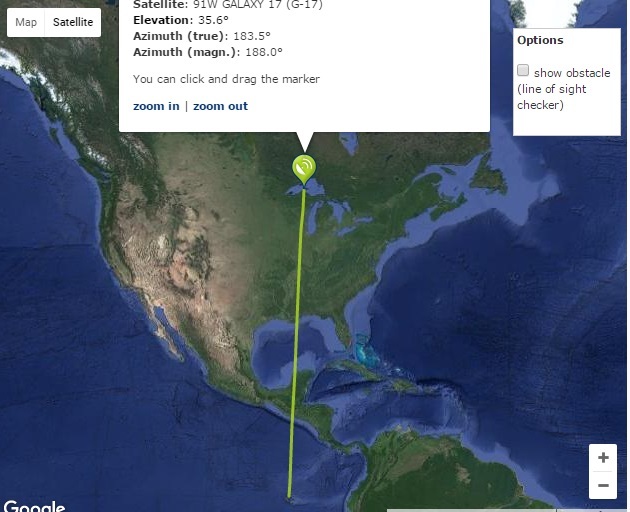 So when operating this far west, we need a satellite that is placed further west along the Equator. 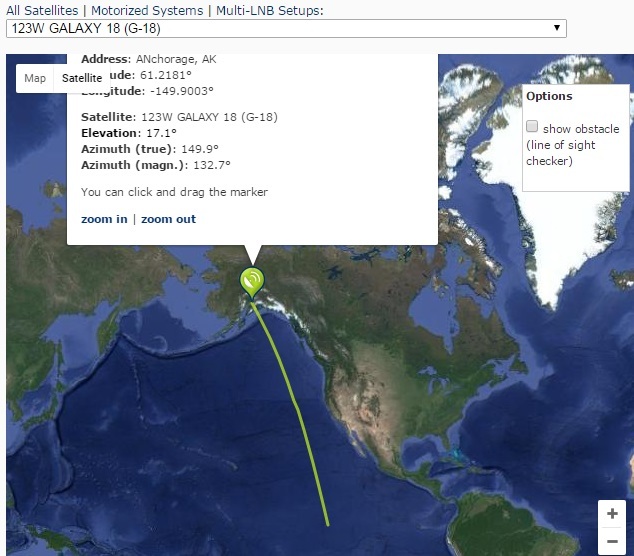 Galaxy 18, located at 123 degrees west, actually has a beam just for Alaska, giving it excellent coverage in Anchorage. And being much closer, the look angle is 17 degrees. Galaxy 18 is also a unique satellite due to its large coverage area. In Santiago, Cuba where we have operated several times, you might think Galaxy 18 is a poor choice because it is so far west, and a more easterly satellite would be better. 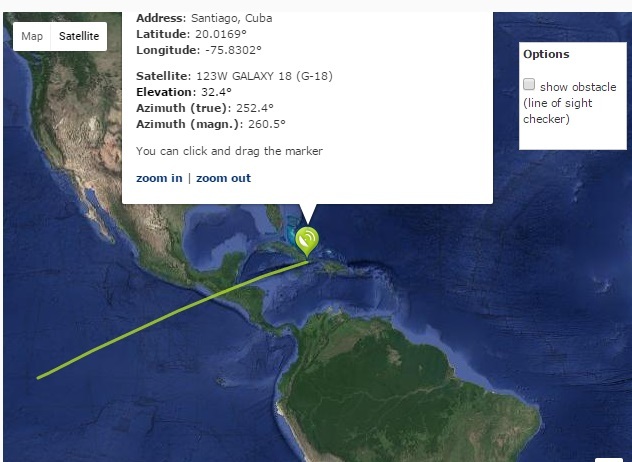 But if you look at the map for Galaxy 17, you can see the coverage drops off quickly though central Cuba, with zero coverage in Santiago, even though the satellite would be easily “visible” there. 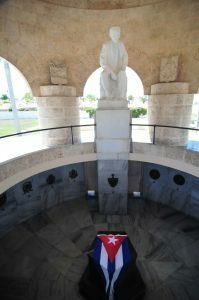 Galaxy 18 is one of the few satellites that has coverage into southeast Cuba, despite its far-west orbital location. Just like a spotlight being directed at a low angle across a floor, the light is “stretched out”, compared to a light that was pointed directly down and more focused. 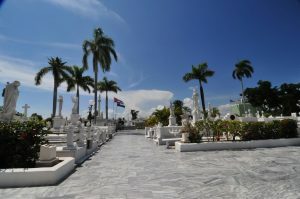 In order for Galaxy 18 to cover Florida, there is some energy that is “spilled” past there, which allows the satellite to be usable in Santiago. 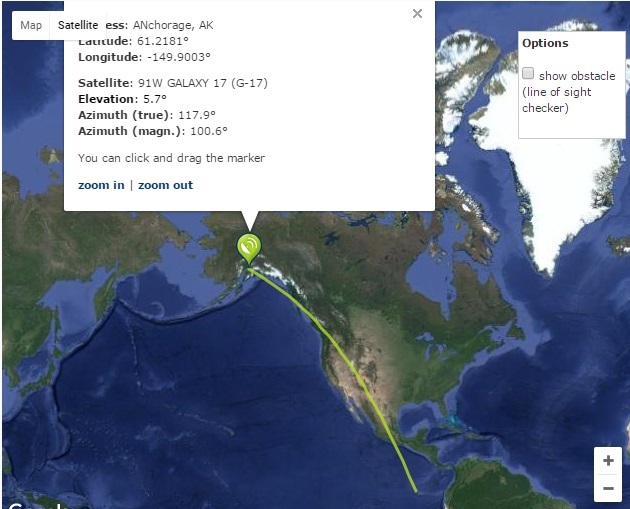 You can see the same effect on Galaxy 17 toward Alaska, although due to its northern location, the satellite is too low in the sky to be practical. 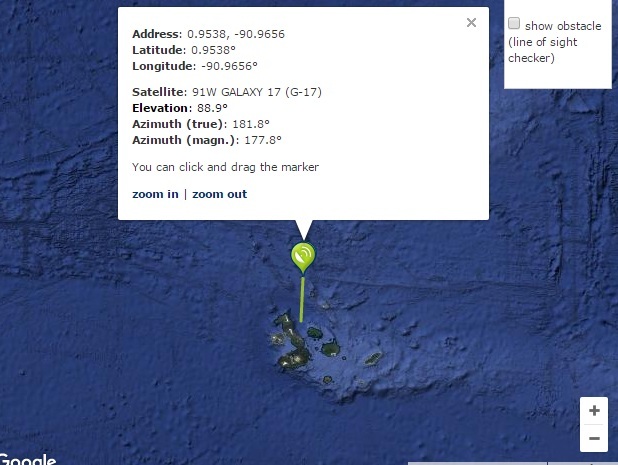 In Santiago Galaxy 18 is 32 degrees, much lower than other satellite in that area, due to its location very far west. 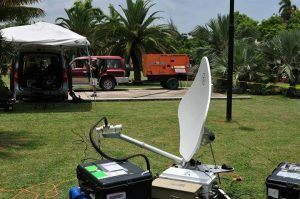 Operating a flyaway uplink system in far-flung locations presents some unique challenges dealing with satellite coverage, and DCI always performs a link budget before doing a broadcast at a new location. 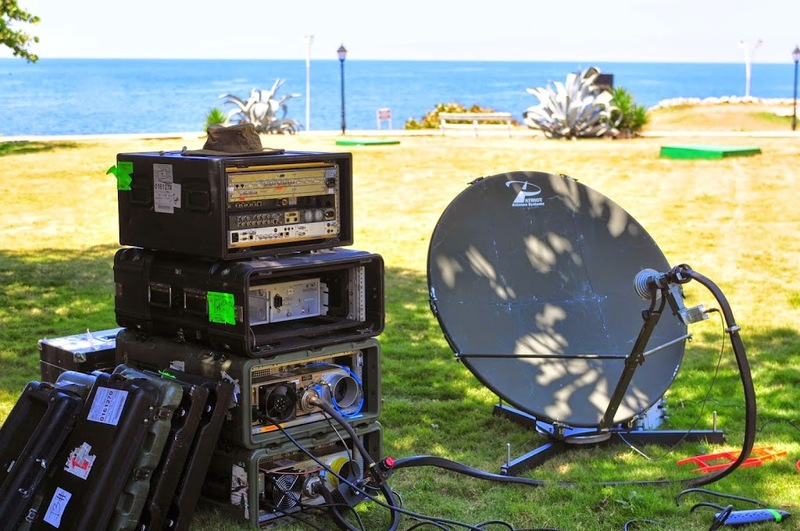 A link budget takes multiple factors into account- antenna size, transmitter power, desired bitrate and bandwidth, and determines how well the link will perform. 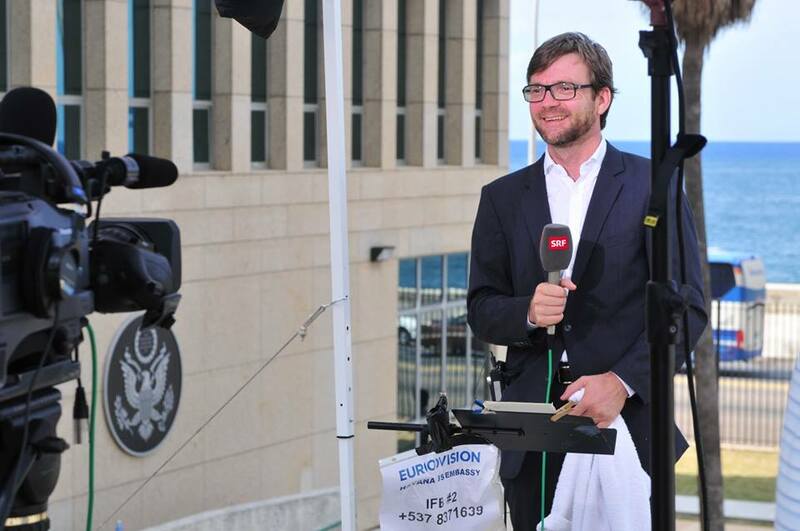 Running a link budget is an important part to a successful flyaway broadcast. 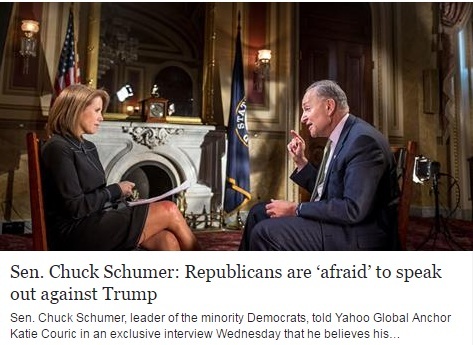 DCI camera crews recently shot this two camera exclusive interview with Yahoo Global Anchor Katie Couric and minority leader Sen. Chuck Schumer. While shooting standup liveshots are an everyday job for our crews, they are also skilled in the art of shooting a long form, multi-camera interview. And of course, great lighting! 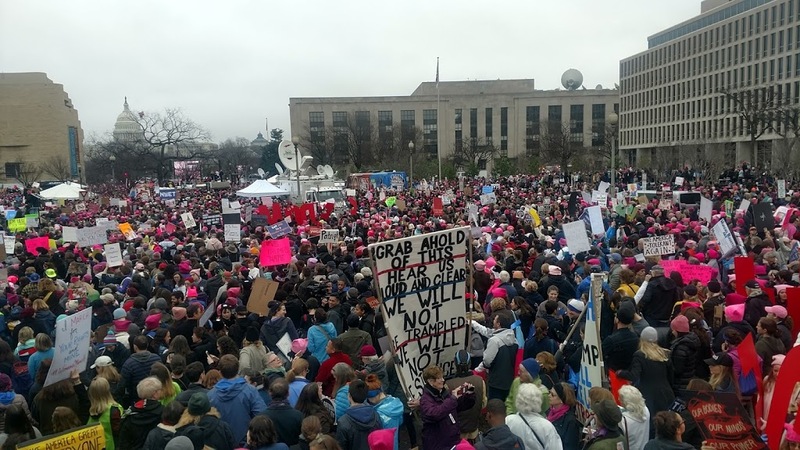 Inauguration Day is the single most busy day for broadcasters in DC, and it was no exception this time. Our teleport had dozens of liveshots coming though our facility via fiber and satellite. 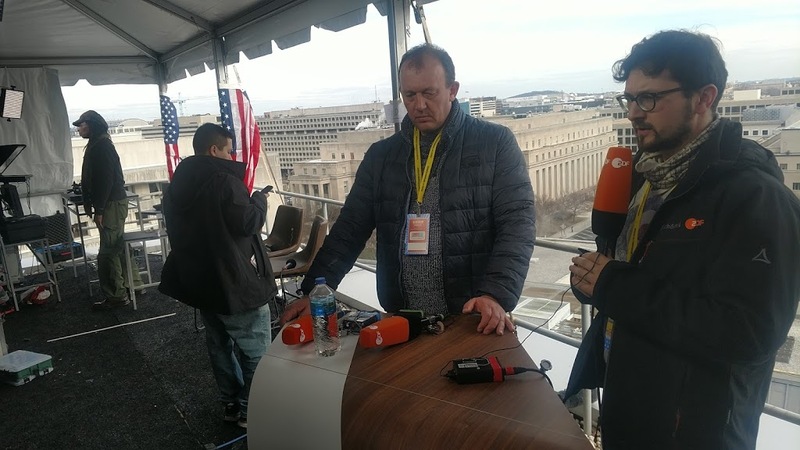 Our flyaway antenna was setup on the roof of the Newseum doing a single-hop to Germany on Hispasat to provide backhaul for a German network’s coverage of the event. 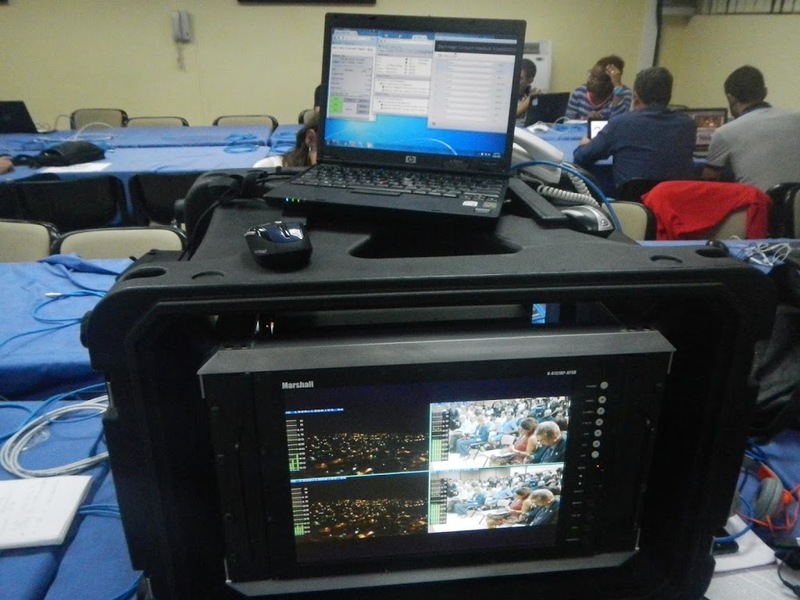 Like on election day, the flyaway was operated remotely from DCI using remote desktop control. 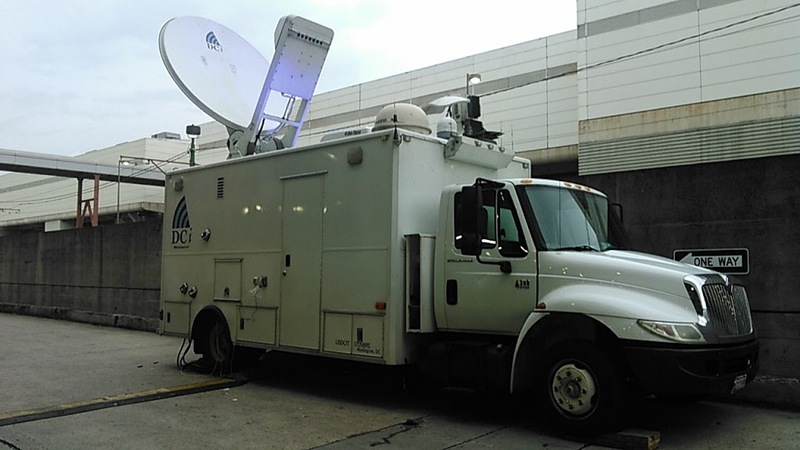 Our HD1 satellite truck was parked at the Convention Center doing 3 paths for network coverage of the event. Transportation on Inauguration Day is always a challenge, so bicycle was the mode of transport between the truck and hotel on the other side of the mall. 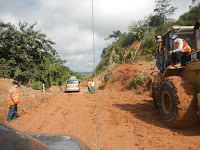 Unlike other years, when everything was over we had another job right away. The Convention Center cleared at midnight and it took almost an hour to drive a half mile across town, with all the traffic and road barriers being cleaned up. 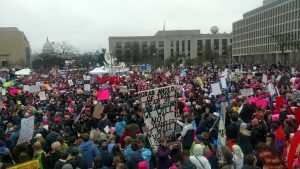 We had two trucks working at the Women’s March, which had so many people we could hardly move around. 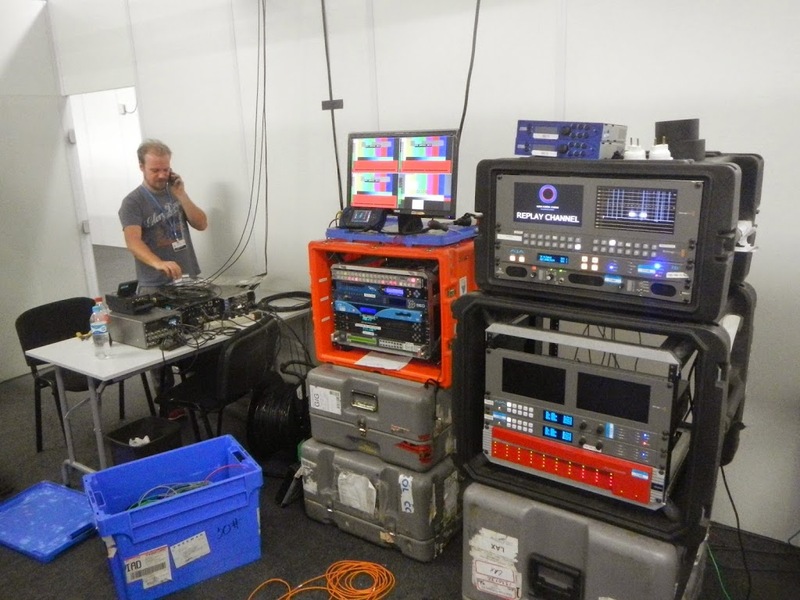 One truck was doing 1080p for a high profile webcast of the event, and the other was providing coverage for Eurovision. 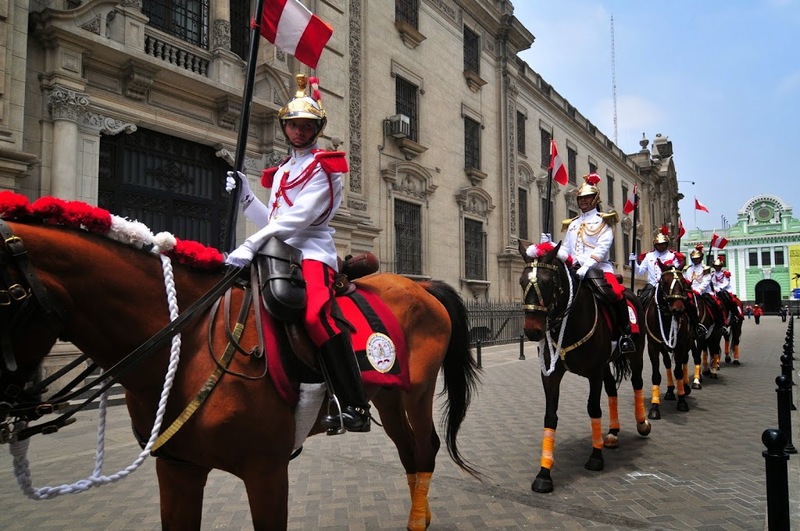 Its another successful inauguration in the books for DCI! 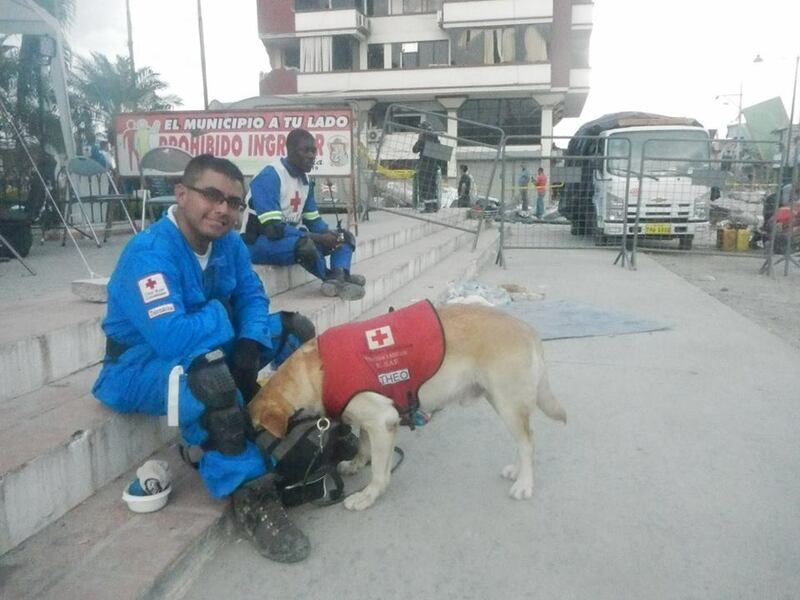 On April 17, a powerful 7.8 earthquake struck off the coast of Ecuador. DCI’s airline baggage flyaway was dispatched several hours later to cover the damage and recovery efforts. 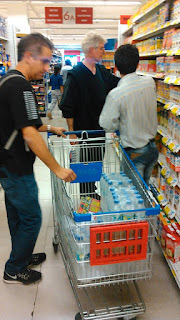 The flight into Quito went without issue, and after all our equipment arrived we visited a supermarket to stock up on supplies, since once arriving in the disaster area there would be no option for food or shelter. 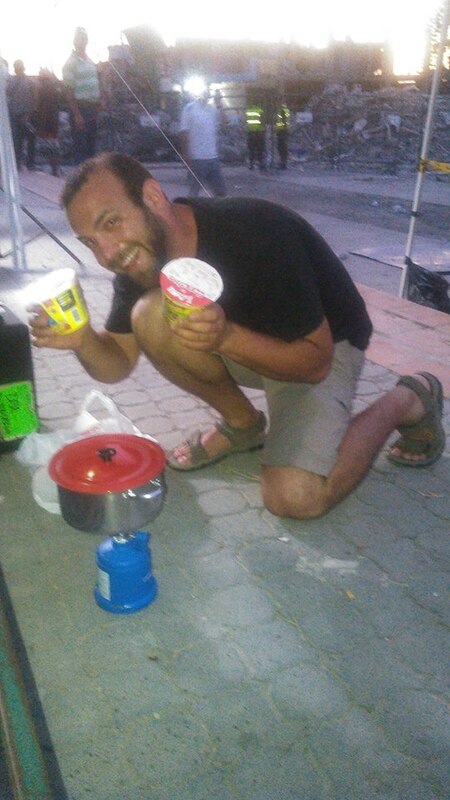 We bought packaged foods, a propane camp stove (for heating water) and tents. 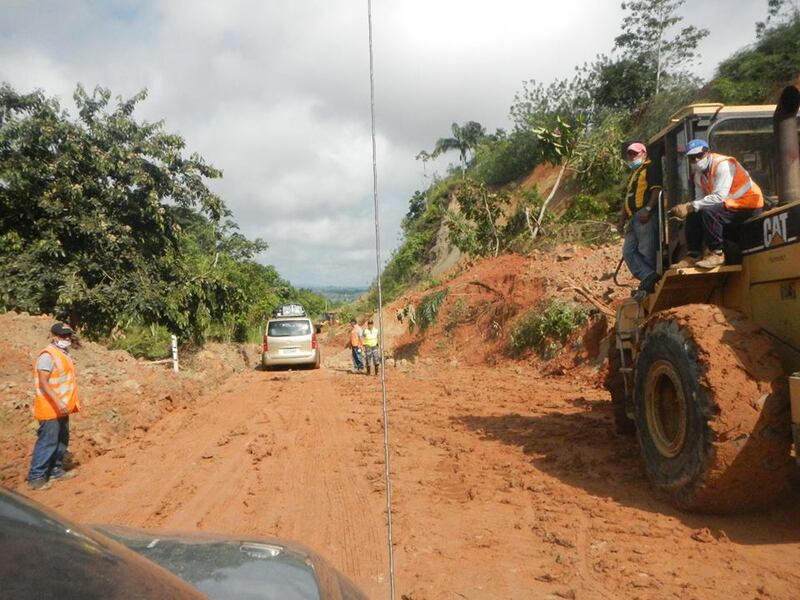 The drive from Quito to Pedernales typically would take about 5 hours but due to the many landslides along the route, the trip took closer to 7. 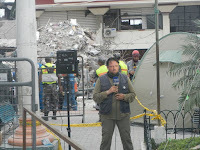 After arriving in the main square in Pedernales, we espatblished a standup location and begain broadcasting, less than 2 hours after arrival. We used the Eutelsat 113W (Satmex 6) satellite to single-hop the signal back to the United States. Due to limited satellite capacity, we utilized advanced DVB-S2X 16APSK modulation to fit two muxed 9 megabit HD signals in a signal 6MHz slot. 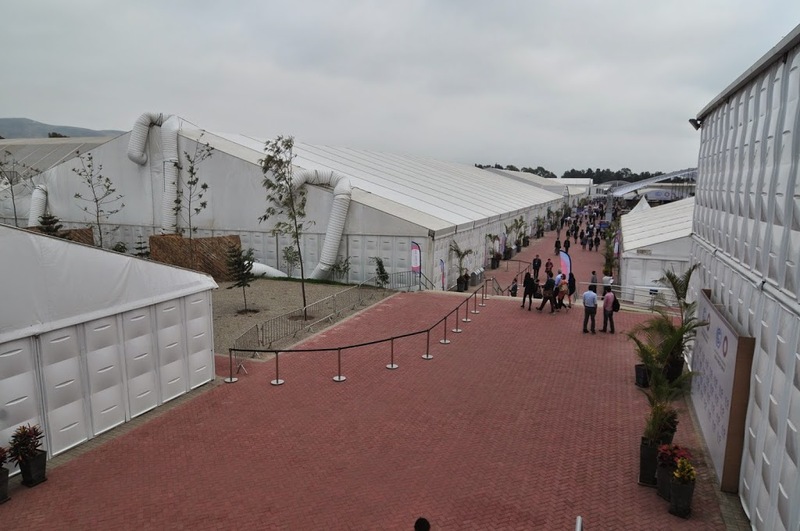 This technology not only saves money on space segment, but also allows feeds to be done when satellite space is limited, as normally happens during large events. 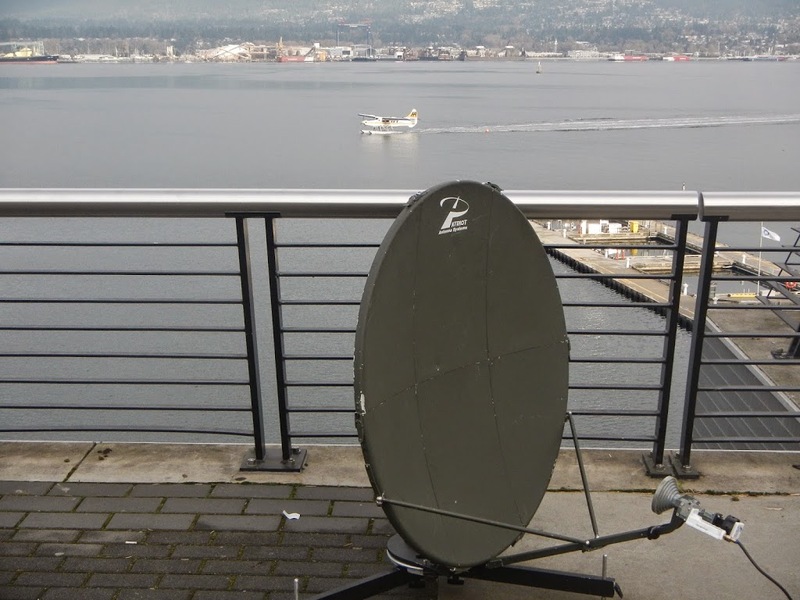 The 16-phase modulation chosen for this broadcast works well with the medium-sized (5 meter) antennas that are common at broadcast facilities. 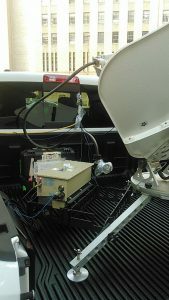 The next step up, 32APSK modulation often requires much larger antennas for acceptable bit error rates. We transmitted live standups and tape feeds all day, for European clients, ABC’s Good Morning America, and several stations from Latin America. 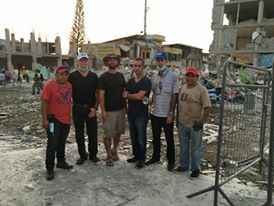 Occasionally the search teams would request we shut down out generators so they could listen with microphones lowered in the rubble pile. Unfortunately there were no rescues while we were on site. 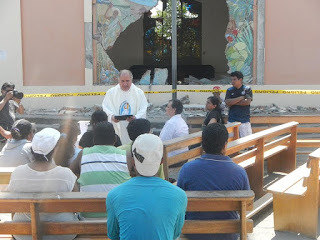 On the morning of the 20th, we had a magnitude 6.1 aftershock, which caused some alarm in the town but there was no additional collapses we knew of. 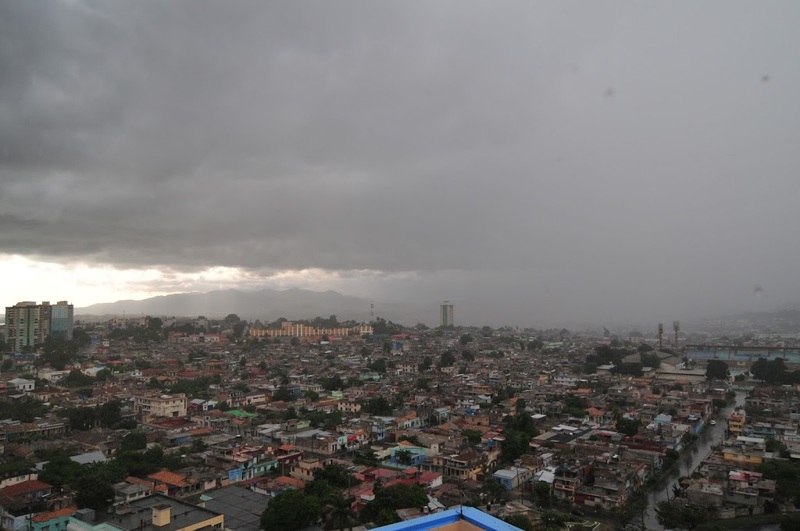 The following day we packed up our equipment and drove back to Quito for a flight the following day. When the White House announced an historic visit by President Obama to Havana, DCI was chosen to provide the official US TV travel pool coverage of the event. 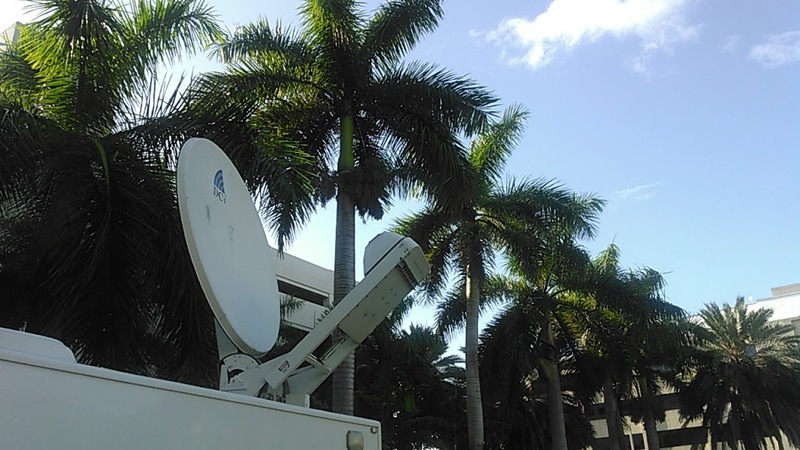 As the most experienced American satellite uplink company operating in Cuba covering 5 different events in the past 3 years, DCI was the clear choice to provide this important pool feed service. 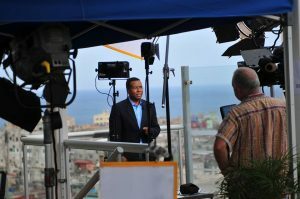 We sent two flyaways to Cuba for Obama’s trip- one for the US TV pool and another working for the Eurovision feeds. 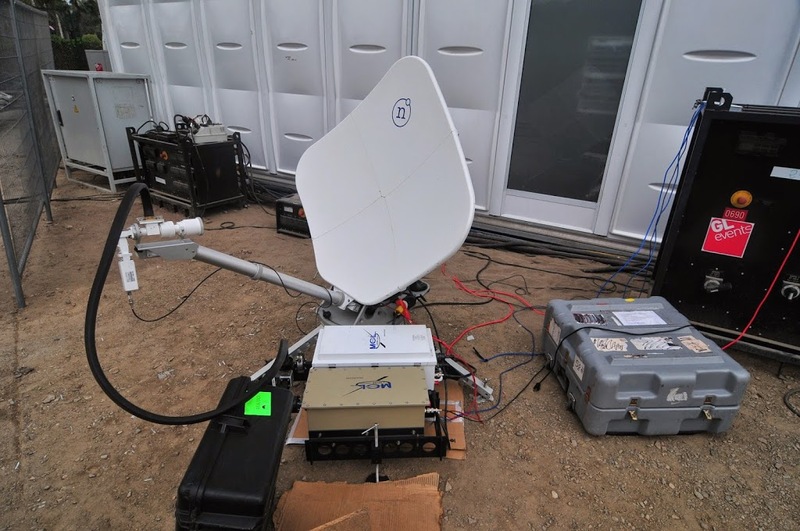 Each dish provided 4 path HD feeds in a mux back to the states. 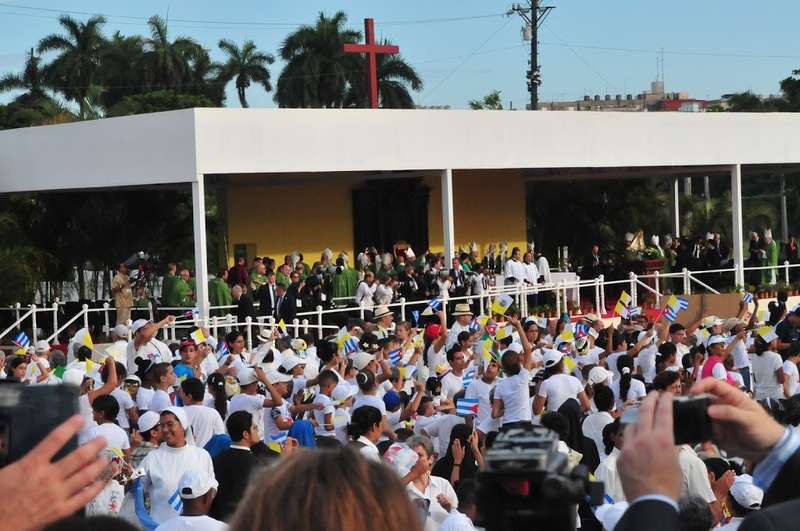 When the Vatican announced Pope Francis would visit Cuba and the United States for the first time in September 2015, we knew it would be a busy time for us. 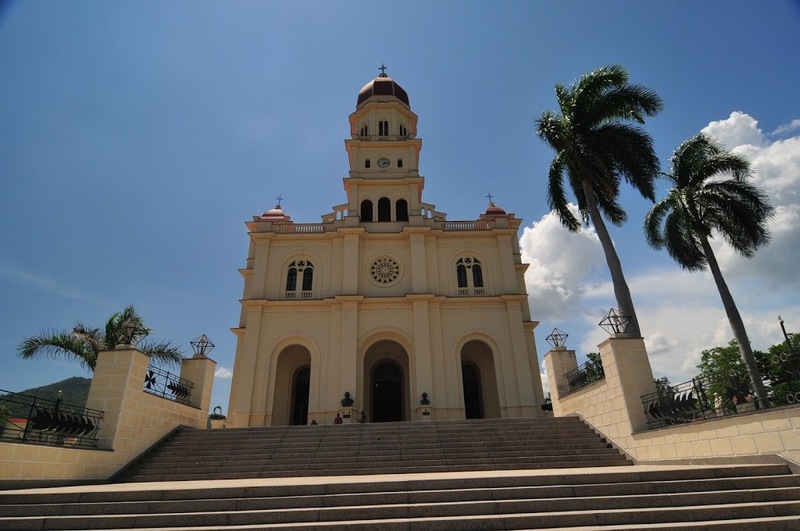 DCI covered Francis’ election from Buenos Aires a few years earlier, and as the first pope from Latin American the Cuba visit would be big. 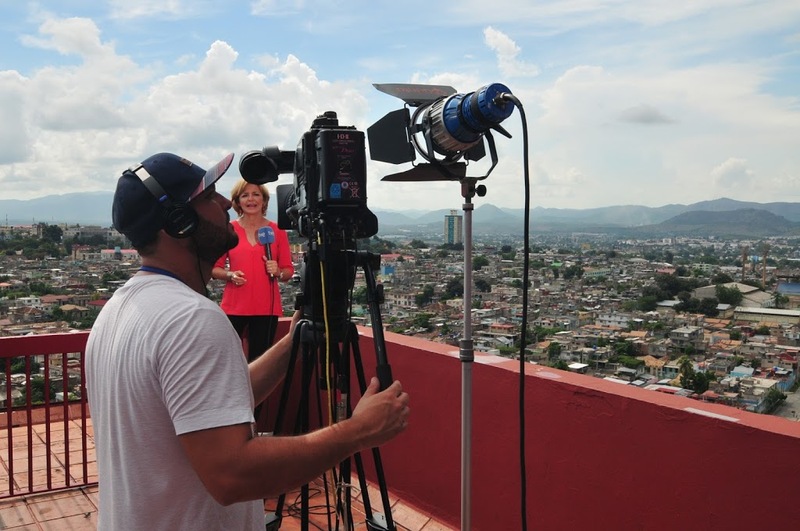 Having just returned from doing pool coverage of the US Embassy opening 3 weeks before, the flyaway kits were turned back around to head for Cuba. 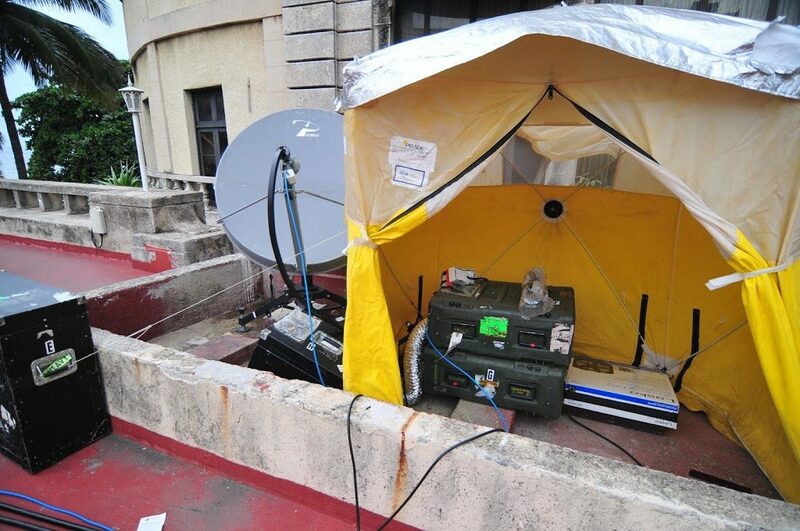 The 1.2m Patriot system was setup as a 24/7 feed point at the Nacional Hotel in Havana, where we had 4 paths supporting live standup positions and tape feeds. 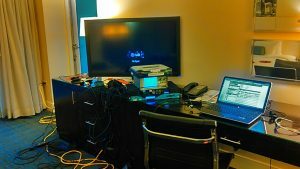 Setup went pretty smoothly, except for one transmitter that would turn on but not respond to any of the front panel buttons. 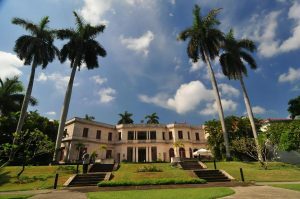 After being told by the manufacturer they would not help us because of export control regulations with Cuba, we had to fix it ourselves! 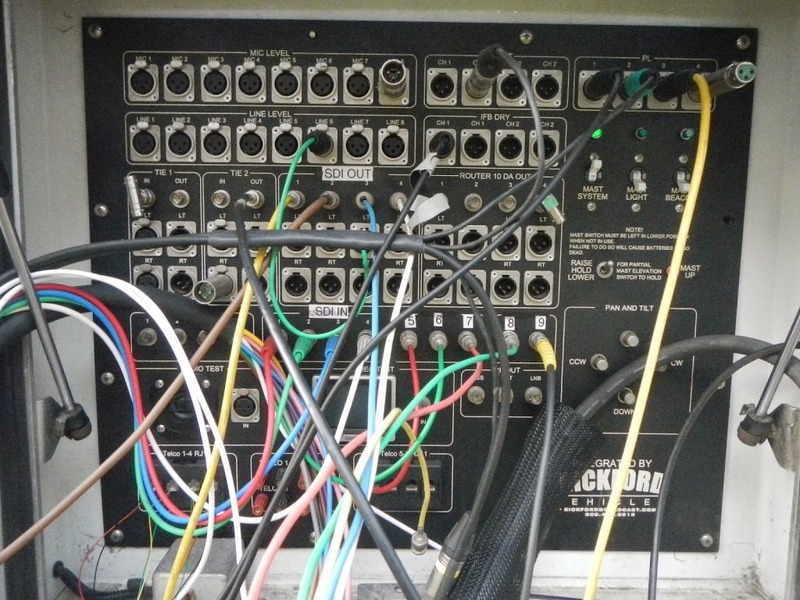 The problem ended up being a connector that came loose in shipping, a common problem when shipping sensitive electronics as baggage on airliners. If you have ever watched a baggage handler throw your bag on the conveyor and cringed, it’s much worse when its a heavy and sensitive piece of satcom equipment! 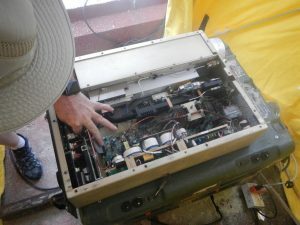 Of course we always travel with 2 of everything for spares, so we had another working unit but after some minor surgery inside the amp we fixed the loose connector and were back online with a redundant set of transmitters. 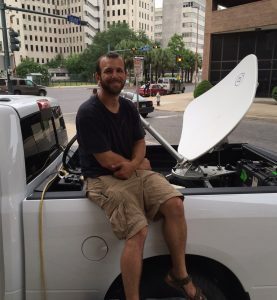 While the feed point dish was humming along, the “travel dish”, our modified Norsat system, set out across town for the live shots during the mass in Revolution Plaza. 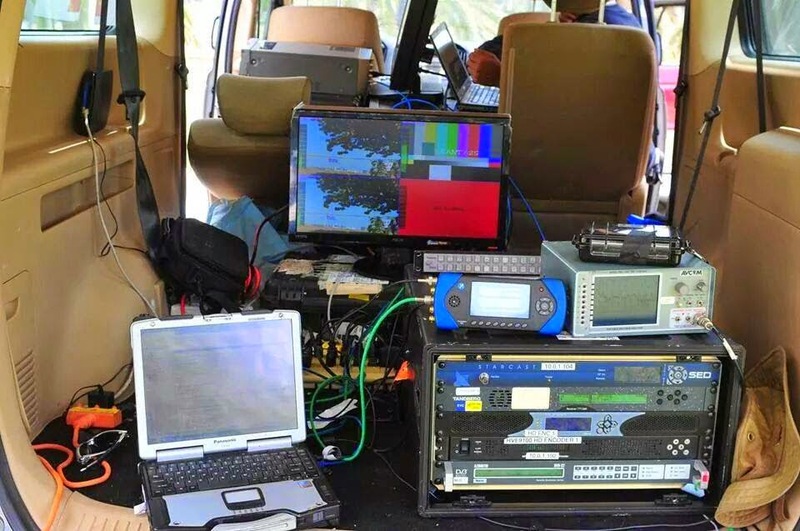 There was a large compliment of uplink antennas here, from CNN’s 2.4m, 4-port monster down to a 1.2m Swedish fly-n-drive system belonging to Overon. 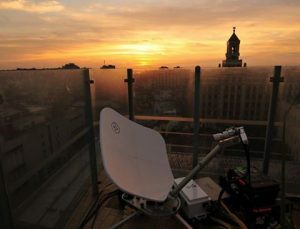 AP was in town from London with a nice 1.8m C/Ku Advent dish, and Reuters had a custom-made 1.0m system. 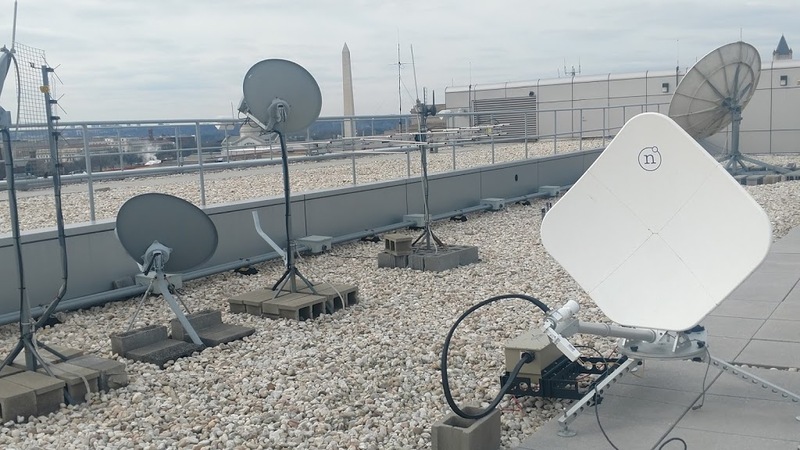 CNN’s 2.4m Ku antenna was running 6 paths plus comms, on both polarities of the satellite (4-port feed), very uncommon to see on a flyaway dish. 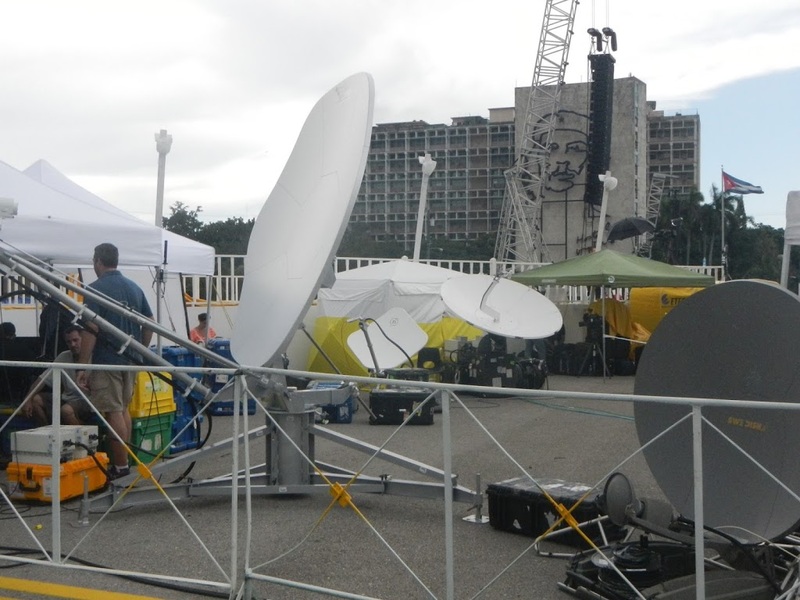 Since our setup was all L band, we mounted the dish on one side of the compound and instead of putting up a tent, our equipment lived under the press riser with two cables running to the dish- the transmit L band and the satellite return + IP signal for running the amps. This system had 2 paths online. 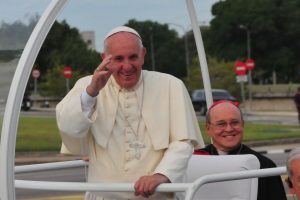 We had a huge downpour of rain during setup day but for the mass the weather was perfect, and the pope drove right past our setup. 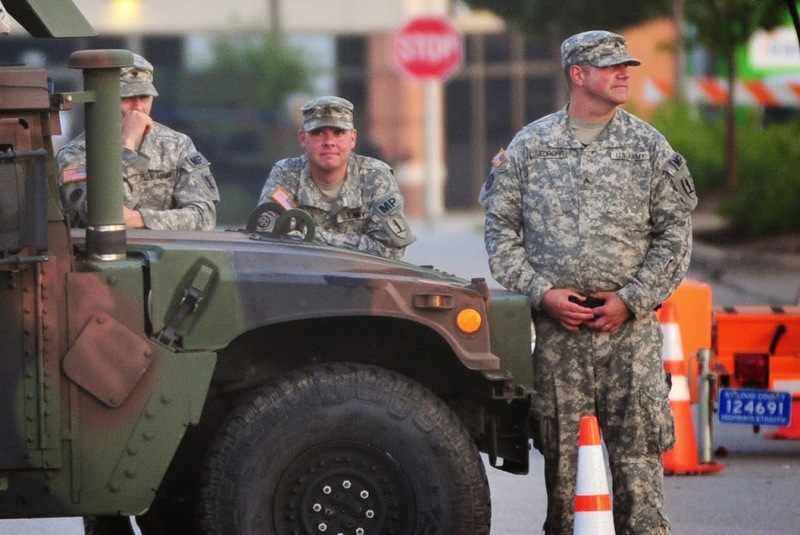 Take Cover! Rain on setup day. 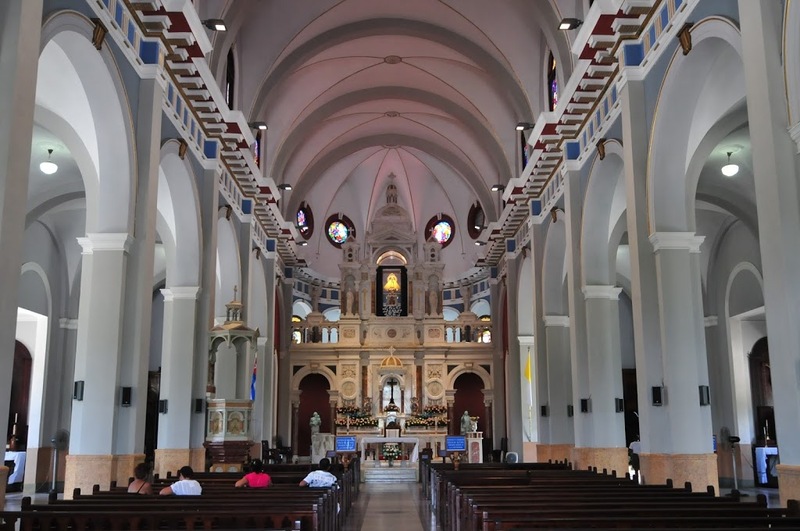 The difference between this mass and the one 3 years ago was very noticeable. Pope Benedict said the mass at the base of the large monument and the general public was kept across the street, about 200 yards away. 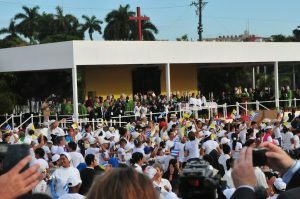 This time the mass was said right in the middle of the plaza with the general public all around, and the pope spent almost an hour greeting people before and after. 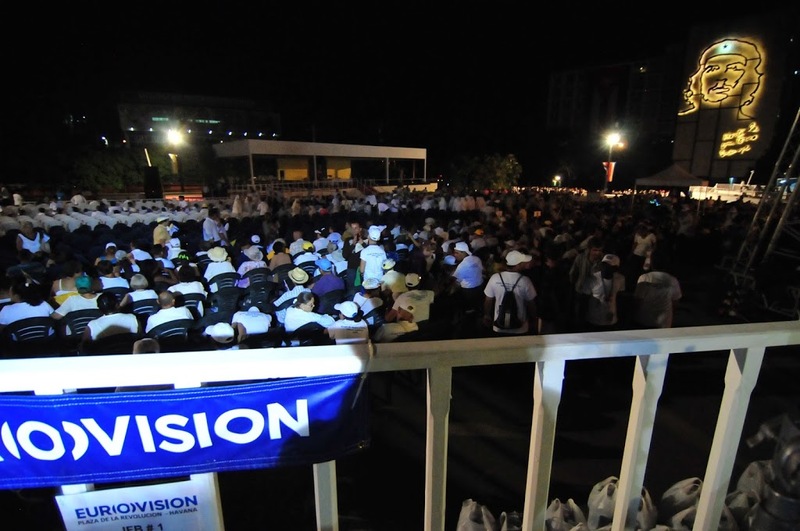 When we arrived at 3AM, the plaza was already packed. 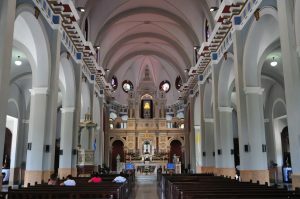 Unlike the previous mass with Pope Benedict in 2012, Francis did not separate himself from the public. 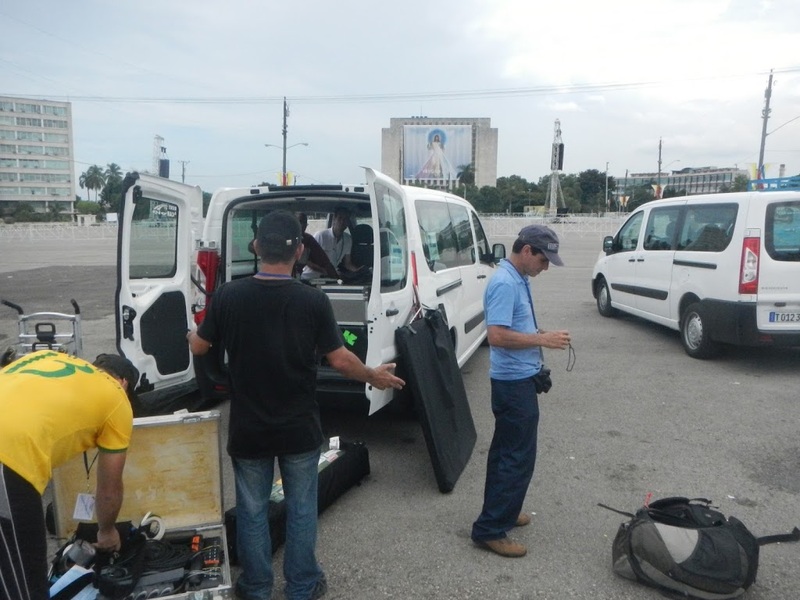 When we were finished here, we packed the dish and camera equipment up into vans for its overnight drive to Santiago. We were supposed to fly out on a 5:30 AM flight, however it kept being delayed. 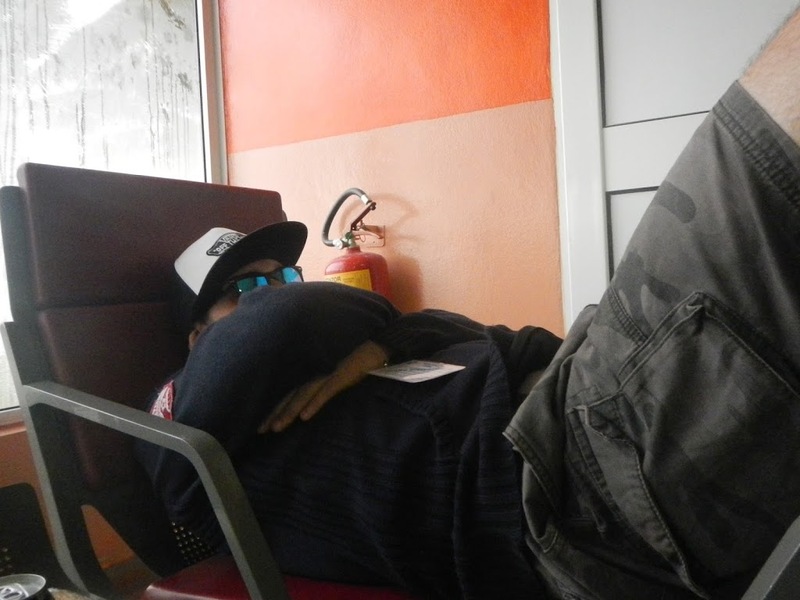 To make it worse, the terminal was freezing and there was nothing more than some small snacks available. 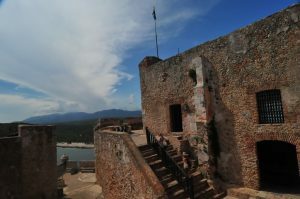 The bathrooms were not even properly supplied! The flight was pushed back to 10:30, but that time came and went, and so did a 11AM flight to the same location, which really made everyone upset. 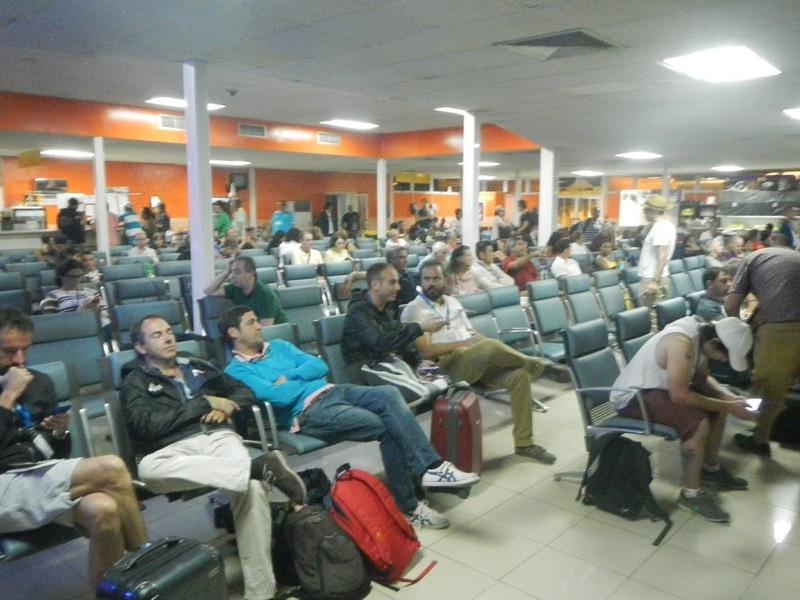 Our plane finally left around around 1:30 PM, about 8 hours late! 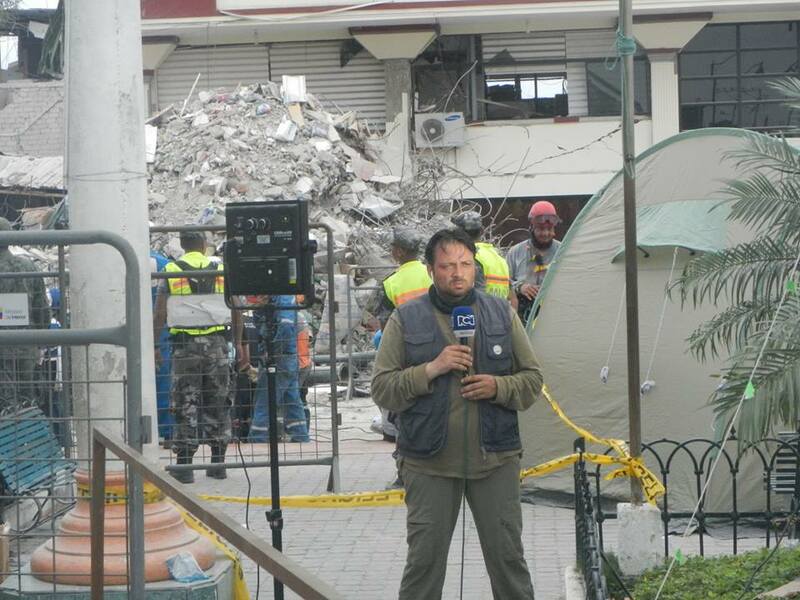 We had live shots that afternoon so we went directly to the feed point in Santiago and were on the air less than an hour later, which is pretty fast for a flyaway setup. Our van drivers/technicians did help by running the fiber and unpacking everything they felt comfortable doing, so that helped a lot. 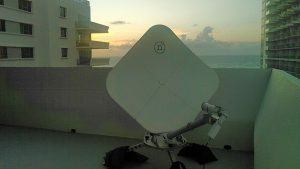 Continental 1.8m C band (left) and our Norsat 1.0m Ku looking far west to Galaxy 18. 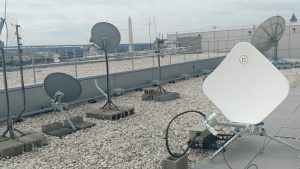 The dish was setup on the roof and too far to run L band cables to the control point inside the hotel so we tried a new technique- we used an available fiber to run ethernet control of everything upstairs like we were sitting up there, including the video router. 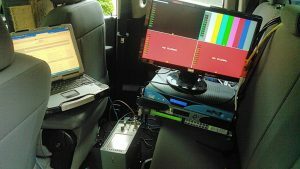 On another open fiber we ran the output of our multiviewer back down to the control point so we could see the quad split on the monitor. 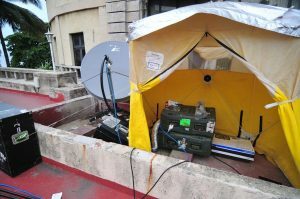 At the control point we had the quad viewer sent from the roof, plus full monitor and control of the router and uplink chain from the laptop. 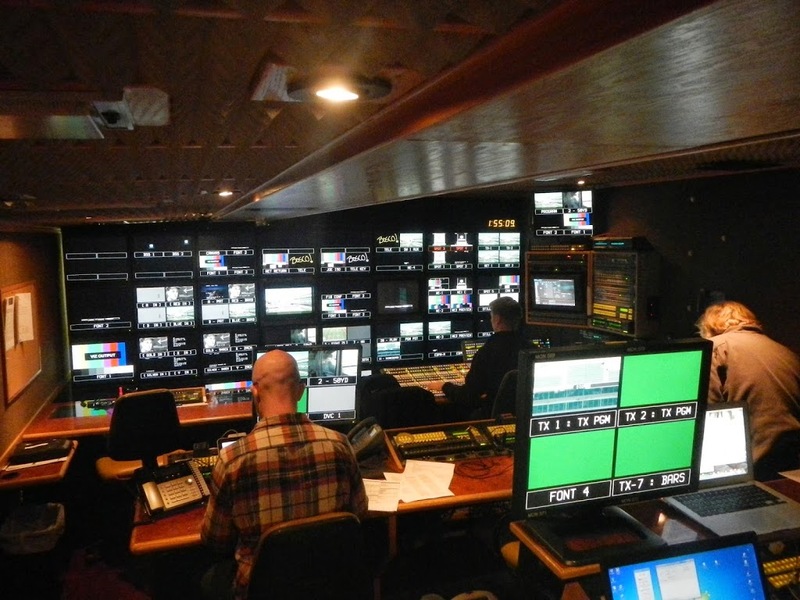 We used a Fiber Media Converter to get ethernet control between the two points and a standard SDI video link to get the multiviewer back downstairs. 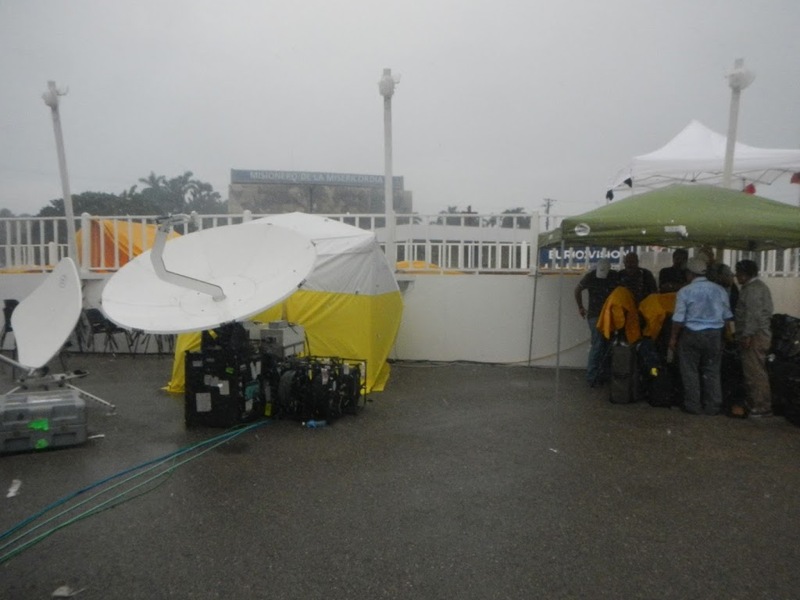 During the two days in Santiago we had two large rain downpours, but because when they happened we had only 1 SD path to do, we changed the modulation down to S2 QPSK 1/2 and even though we had a completely flat spectrum on return, they had a 11 dB margin back in DC! This quick thinking saved the day during the rain storms. 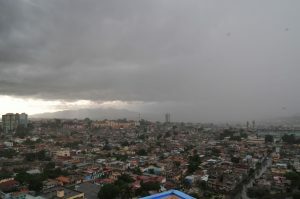 Rain storm moving into Santiago from the mountains north of town. 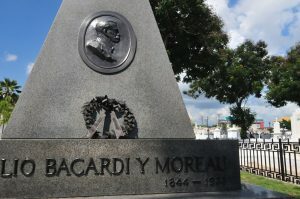 After we packed up the next day was spent visiting some of the sights around Santiago- El Castillo (a fortress overlooking the entrance to the harbor), the cemetery where many prominent Cubans are buried including Jose Marti and Emilio Bacardi (and most likely Fidel Castro will be buried here too) and the shrine at El Cobre, where the pope said mass the day before. The flight back to Havana was later that day and the next we flew back to Miami and on to DC. 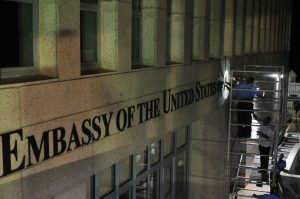 Workers add the “Embassy of the United States of America” signage to the front of the building in the early morning before the opening ceremony. When the United States Department Of State reopened their embassy in Havana, there was a lot of interest from broadcasters around the world. Many setup live positions at the balconies surrounding the building, however with the limited space on the embassy grounds, the State Department came to Washington’s premiere satellite company for two shared uplink systems that would be made available to broadcasters. 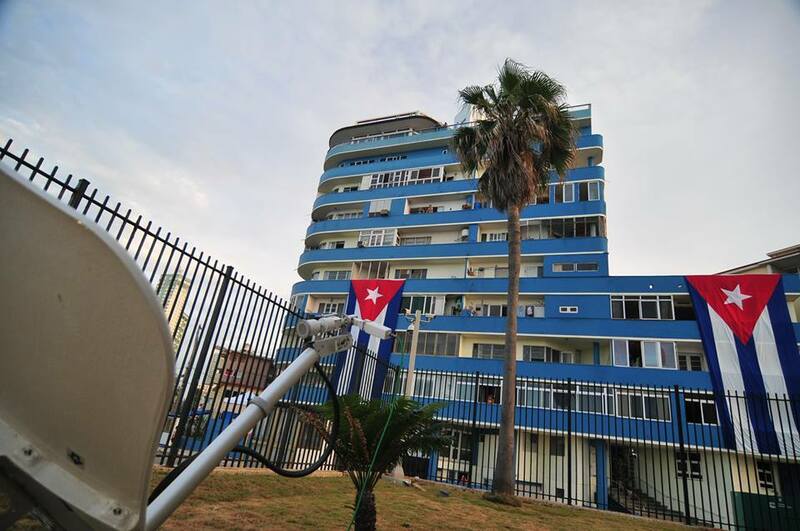 The State Department chartered a flight from Baltimore to Havana and we loaded two flyaway systems along with all the government’s equipment for the opening ceremony. 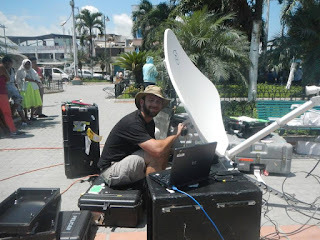 Each dish was setup for 4 HD paths, for a total of 8 paths coming out of Havana. Like usual, we used muxes, DVB-S2, and H.264 encoding. 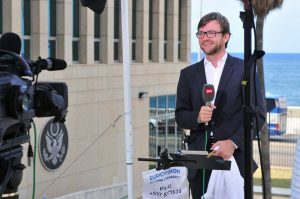 The State Department worked with both Eurovision and Associated Press to make 4 live shot positions (2 each) available to media worldwide. 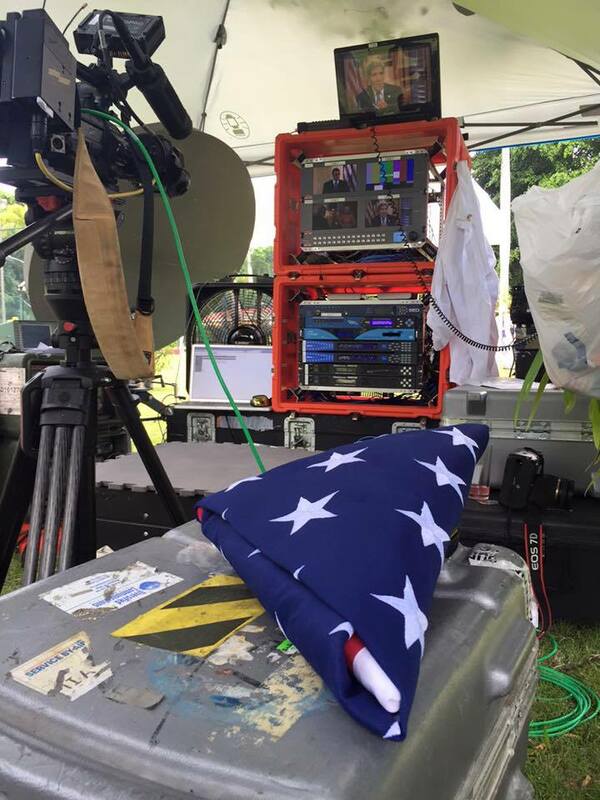 During the ceremony, two of those paths carried the official switched feed of the program and a cuts camera, which was made available and carried live on many outlets worldwide. 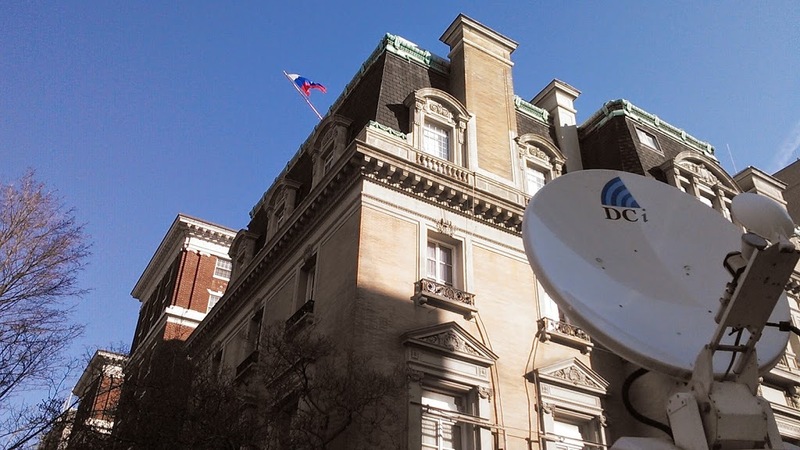 DCI Teleport downlinked the official feeds for the State Department and fed them live via fiber for further distribution and webcasting. Some might say the Cubans “out-flagged” us. 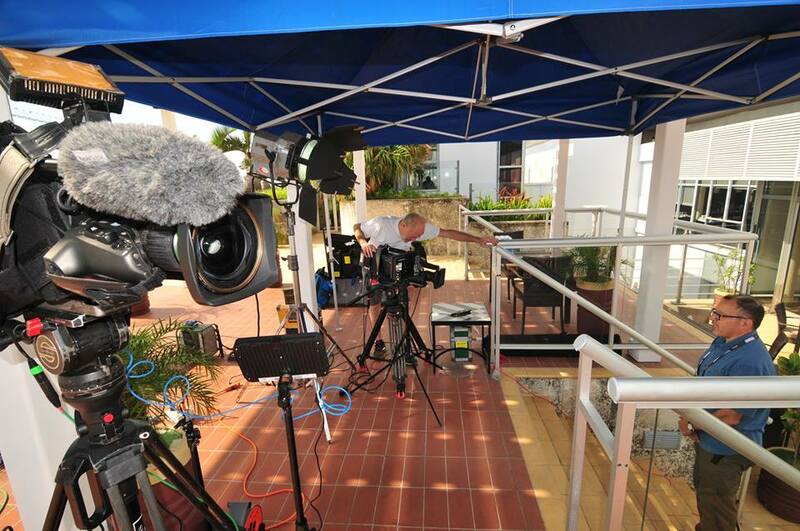 Most of the US networks had live positions on these balconies and dishes on the roof. 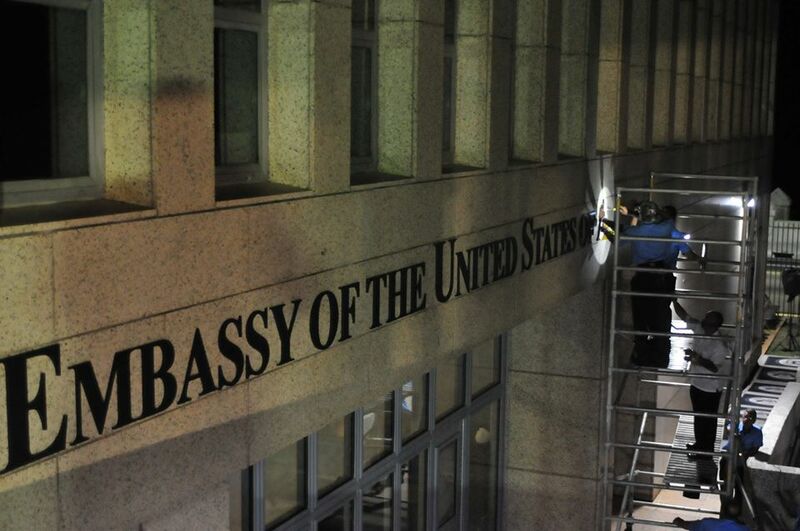 Some used microwave to shoot from the media riser at the embassy. Live shot going to Europe on the EBU network via the DCI dish. 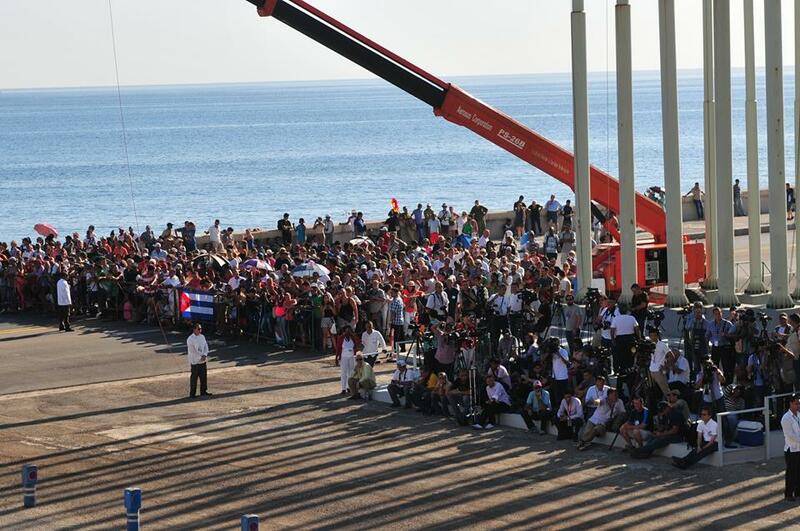 Crowd of Cubans watching the event across the street, and a camera platform for Cuban TV. 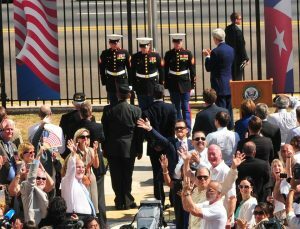 Secretary Kerry applauds as a cheering crowd looks on. 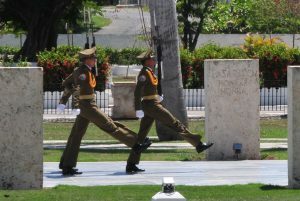 The 3 men facing the color guard are the US Marines who lowered the flag the last time, in 1961. They vowed they would return to raise it. The second dish was setup at the Ambassador’s residence, which served as a feed point and interview spot where 2 paths were used by the State Department to feed B roll of various diplomatic events around Havana, and the other 2 paths were used by the US networks to feed video from their sit-down interviews with Secretary Kerry. 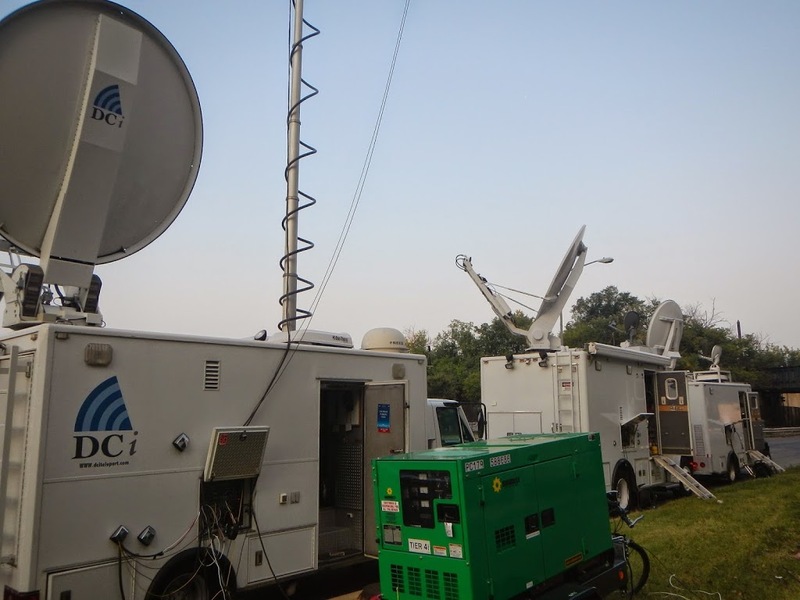 After a busy day for both uplinks, we packed up and headed back to DC the next day, another flawless field transmission in the books. Contact DCI to see how we can put our expertise to work for your challenging satellite needs! 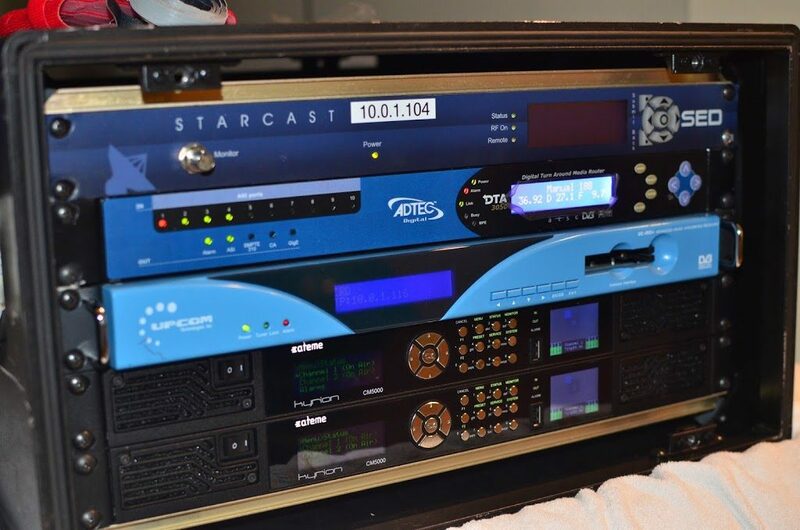 DCI recently added new Ateme hardware to our encoder and decoder inventory. 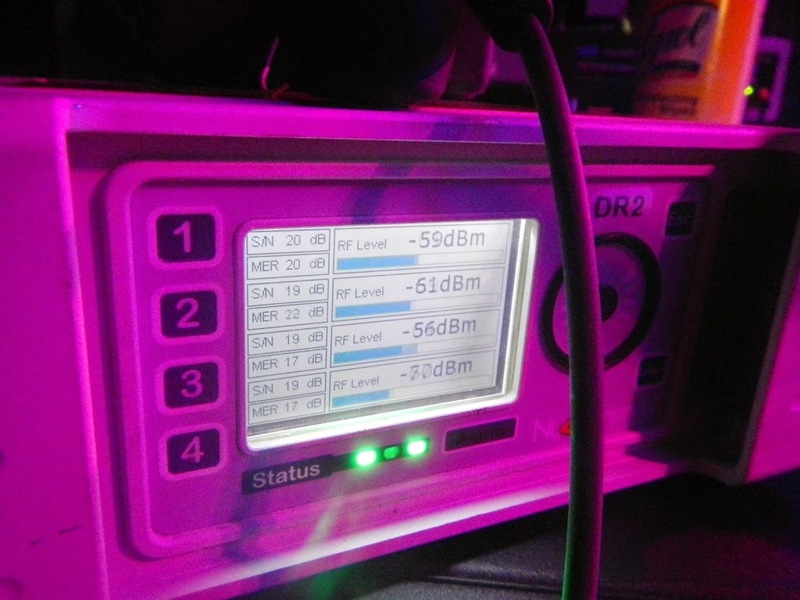 Three DR5000 receivers were added to our teleport, expanding DCI’s capacity to decode ultra low-latency feeds and high quality encoding such as 10-bit 4:2:2 and higher-order modulation up to 32APSK. 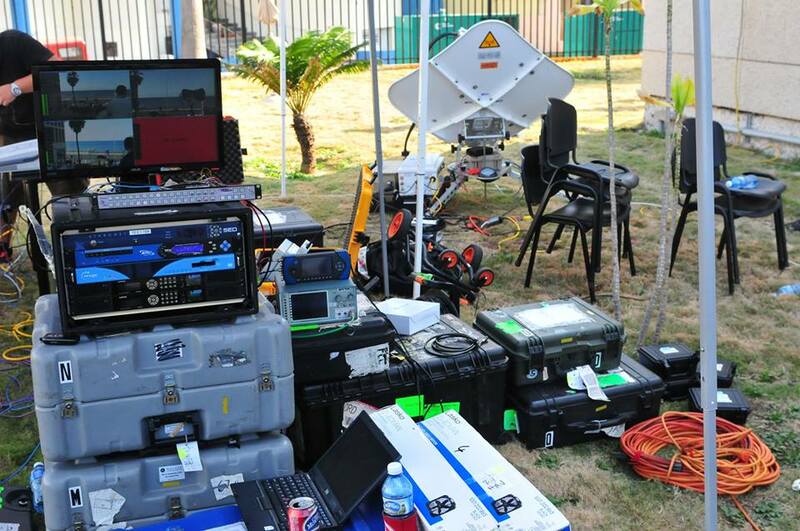 On the transmission side, DCI added two CM5000 “Dual Kyron” encoders for on-demand use in the teleport and field. 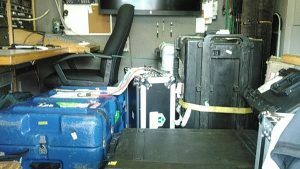 Our CM5000’s feature TWO encoders inside the same box, allowing us to have the most portable 4-path flyaway available in the United States. The two dual encoders are part of a package which will be broadcasting the pool feeds of the American Embassy opening in Havana on Friday. These new acquisitions compliment DCI’s previous investment in Ateme hardware, which power our ESPN-certified “HD1” uplink truck with high quality H.264 4:2:2 video and 16-channel audio. 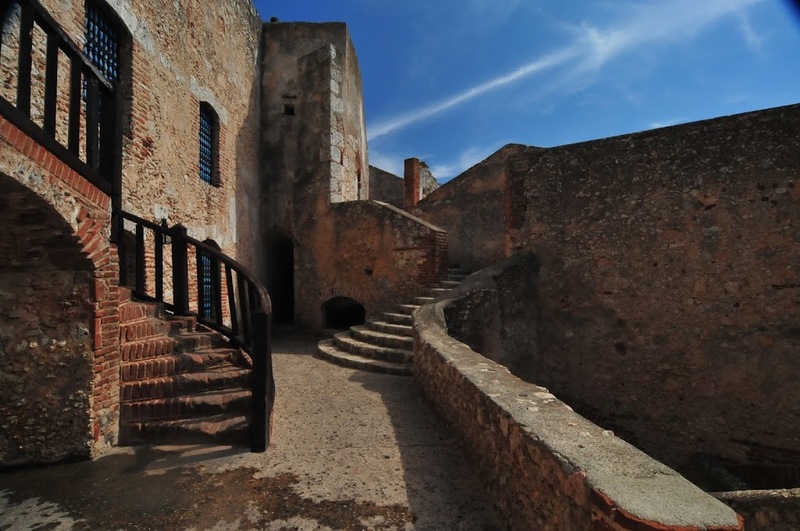 Our Ateme hardware is completely software-driven, with enough hardware power for future expansion. In fact, both the CM5000 and DR5000 have the processing power necessary for the new H.265 High Efficiency Video Codec (HEVC) and DCI will be adding H.265 capability sometime next year with a new firmware release from Ateme. 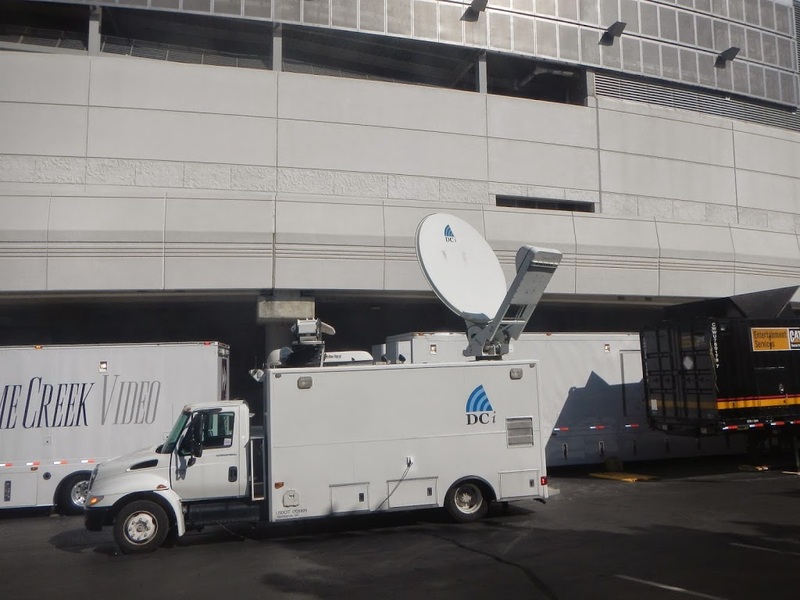 As one of the oldest independent teleport and SNG operators in the United States, DCI remains committed to staying on the cutting edge of video compression technology. 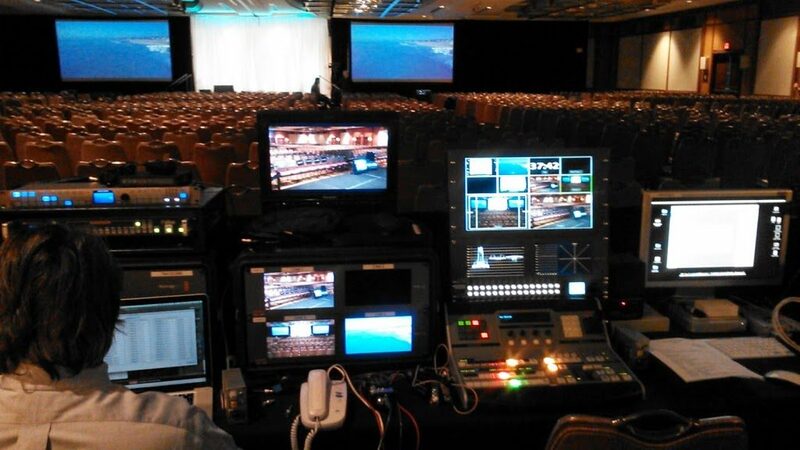 Contact us to see how we can put this powerful new hardware to use for your next event. Two Dual Kyron’s in a flyaway rack for the American Embassy opening in Havana. 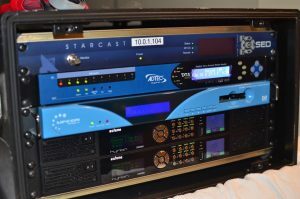 Also in the case is a Starcast DVB-S2 L band modulator, Adtec multiplexer, and UpCom IRD. 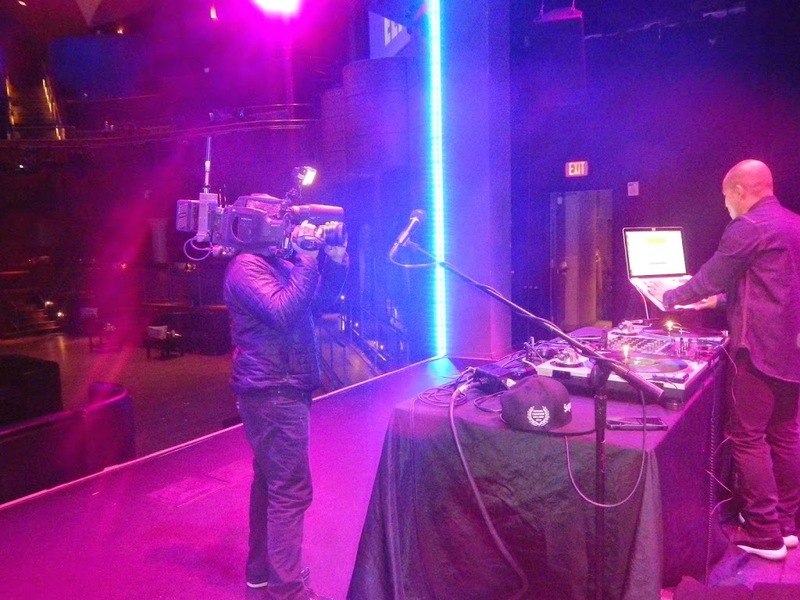 We kicked the year off with a large production and uplink as part of a corporate event held in Baltimore. 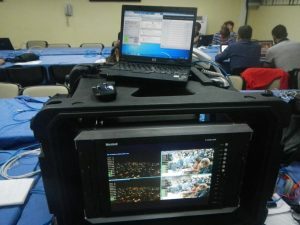 DCI provided the transmission, along with the switcher, graphics, cameras and audio in the conference room, including a jib camera. 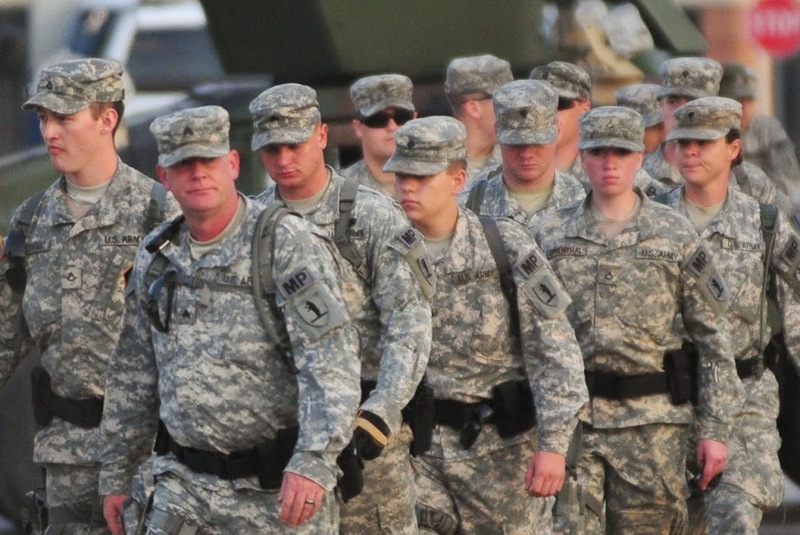 The Sochi Olympics opening ceremony took place late morning DC time, and was not available live in the United States. We were asked to receive a feed of the event brought in from Russian TV (encrypted, of course, to keep NBC happy). 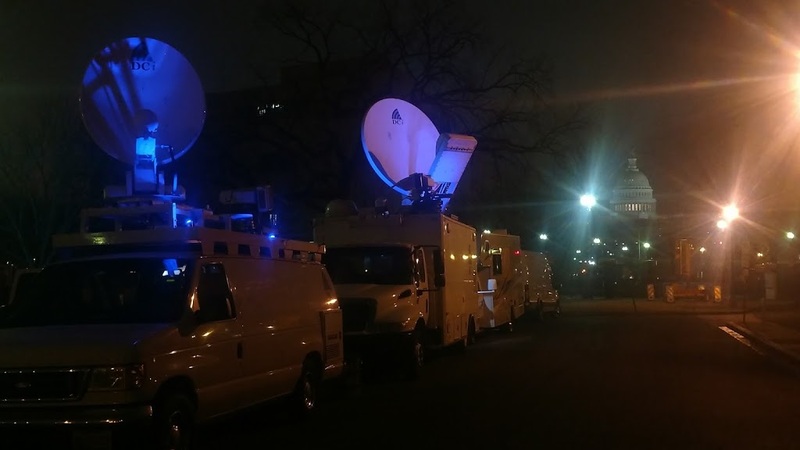 We parked our compact satellite truck outside of the gilded former Russian Embassy down the street from the White House, which now serves as the Ambassador’s residence. 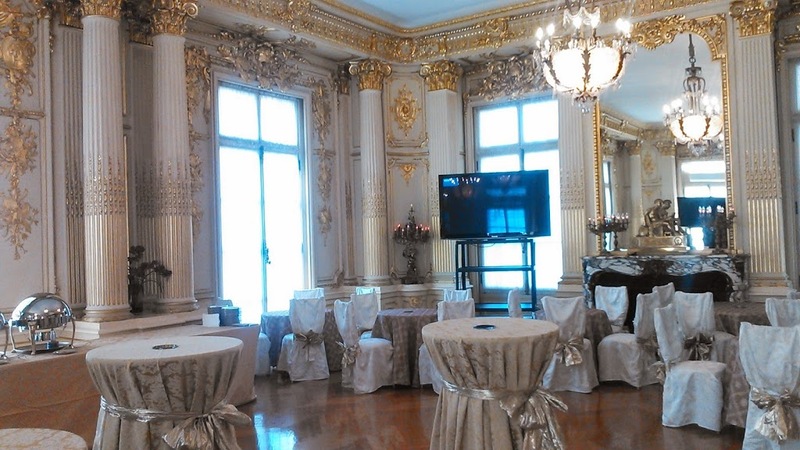 The Ambassador was hosting a party for VIPs to watch the opening ceremony on monitors spread out throughout the reception rooms. 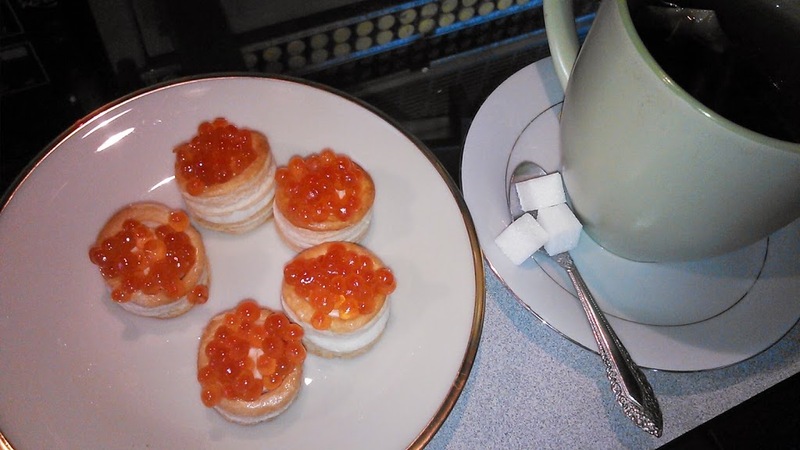 The embassy staff brought Black Sea caviar and tea out to the satellite truck. 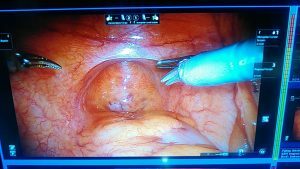 DCI and BoxLine Box produced the first-ever 3D surgery broadcast at the AUA convention in San Diego in 2013, for Intuitive Surgical. 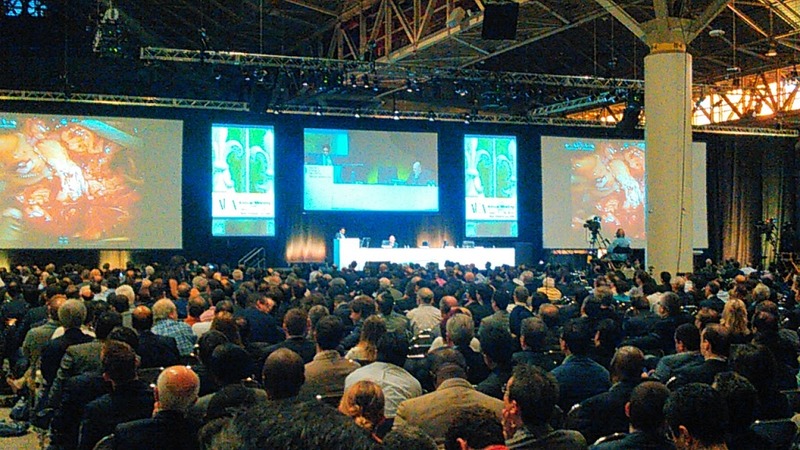 The 2013 show was so successful we were asked back to produce all the live surgery at the 2014 convention in Orlando. After the AUA show, we took the sat truck down to Miami, and did our own downlink using our Norsat flyaway and a remote-controlled receiver for an AUA-related event at the Eden Roc in Miami Beach with the truck transmitting from Miami General Hospital. 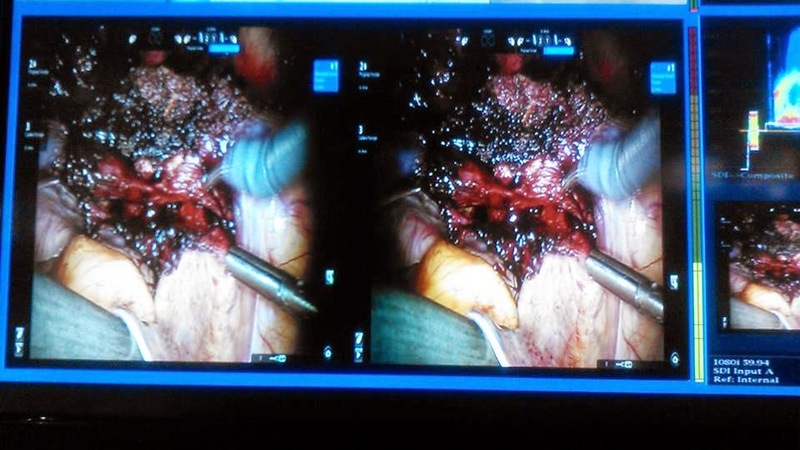 Read more about the 3D surgery here. We took two flyaway systems to Cuba for the second time in as many years. 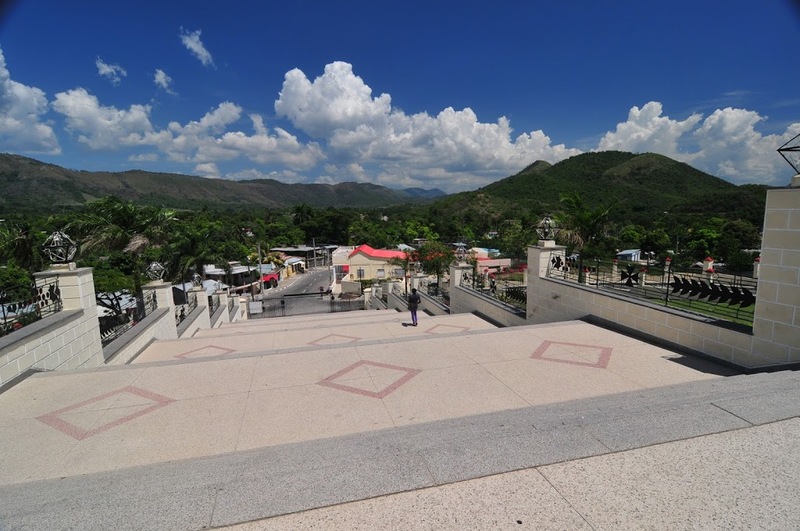 This trip was to cover the state visit of Xi Jinping, President of China, to Cuba. 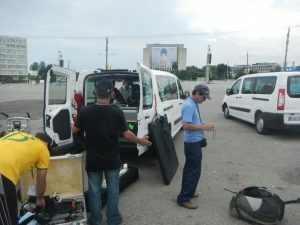 We set up one system outside the Nacional Hotel in Havana before driving 8 hours across the island to the port city of Santiago for live coverage for Chinese TV. 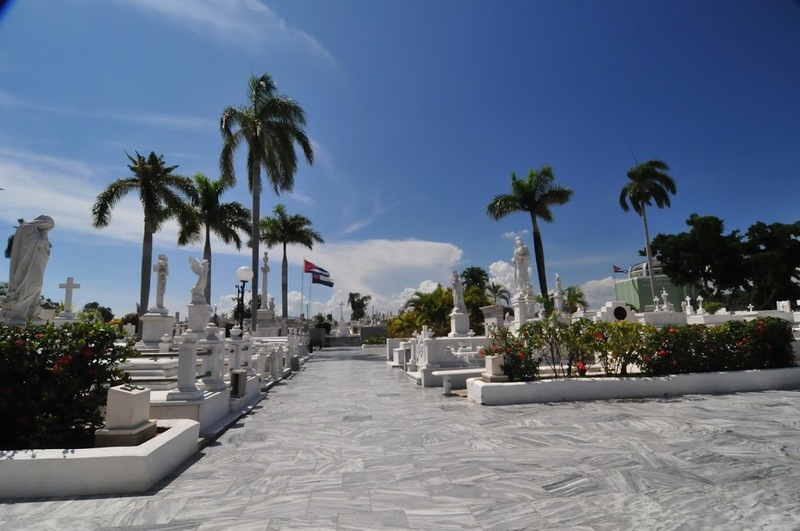 More from the 2014 Cuba trip. 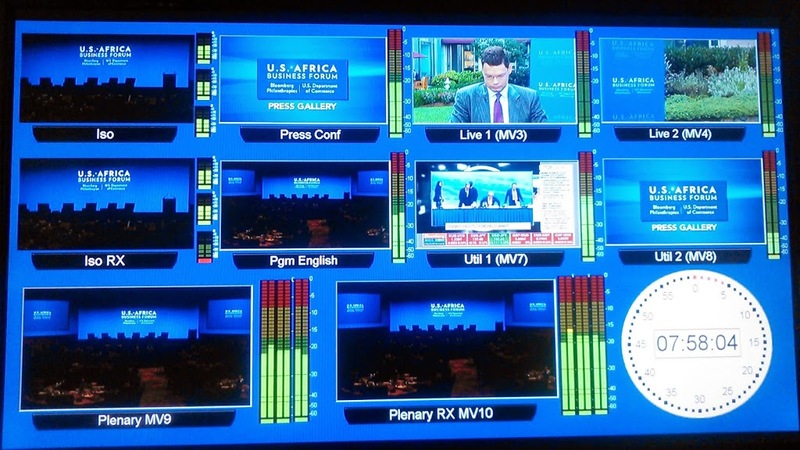 In August 2014, President Obama hosted the US-Africa Leaders’ Summit, which was the most heads of state in Washington ever. With so many VIP’s in the city, logistics were difficult, and both of our satellite trucks were present to be the pool feed for host broadcaster Bloomberg TV. Our HD1 uplink truck provided six muxed HD paths with multiple audio languages, while our compact SNG truck stood as backup. 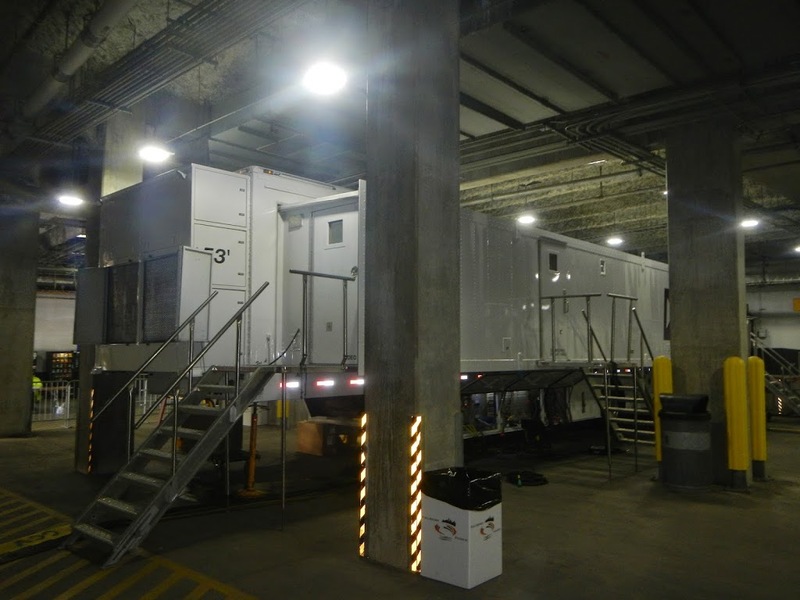 A year after finishing our qualification for ESPN in Bristol, we snagged our first job for the network, a college football game in Cincinnati (held in the Brown’s stadium) for ESPN-2. 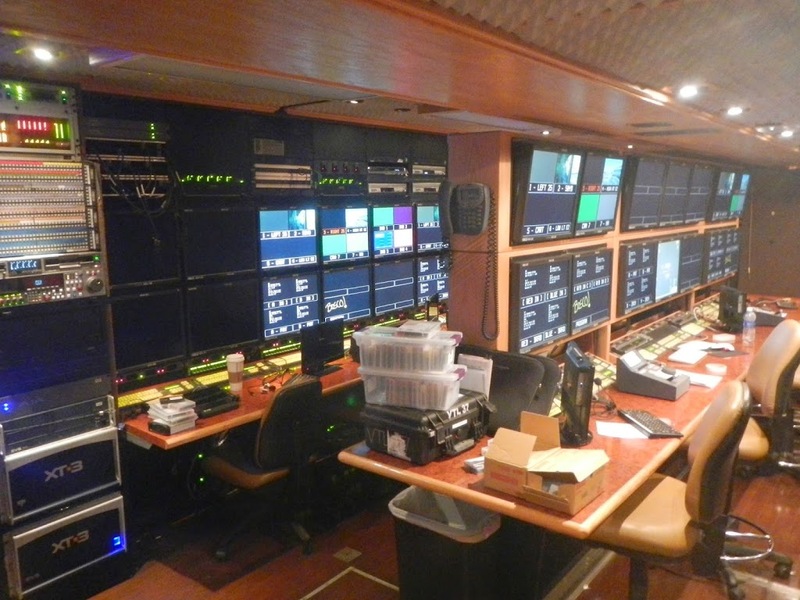 including a full 16 channels of audio. 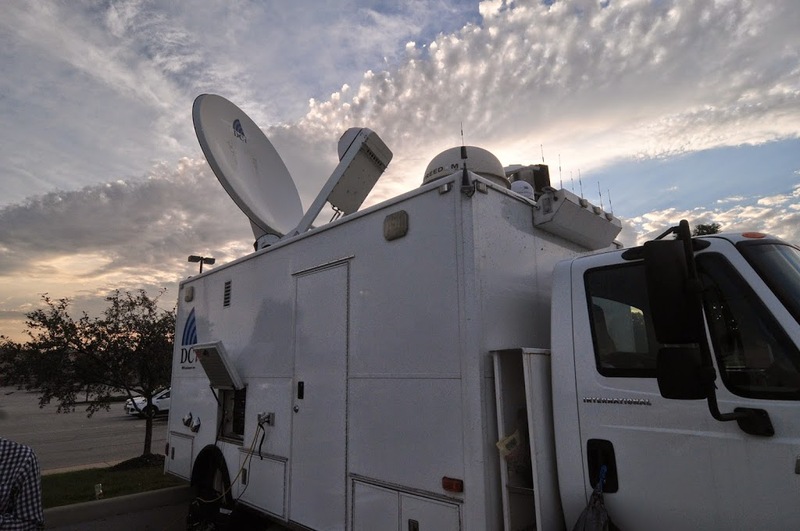 Our HD1 uplink truck travelled to the St. Louis area to cover the rioting in Furgeson. 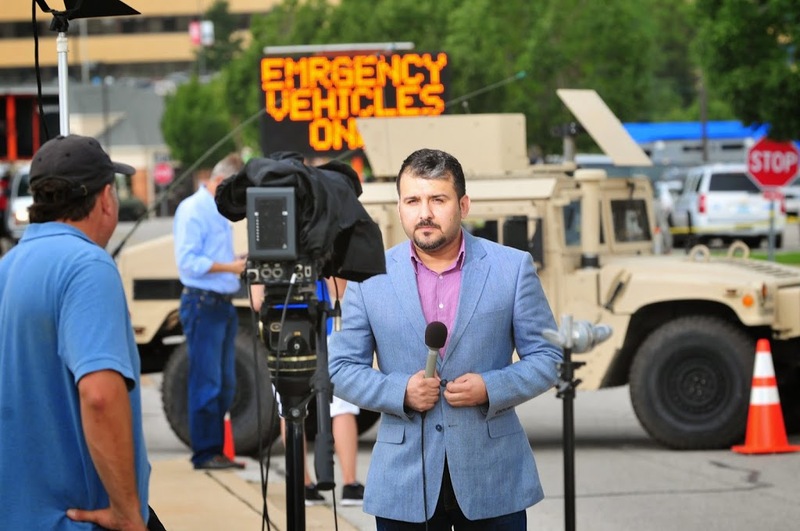 This was actually the first of two last-minute trips we made for this story, the second was a month later when the grand jury results were announced. We provided multiple HD and SD uplinks to Europe during this job. 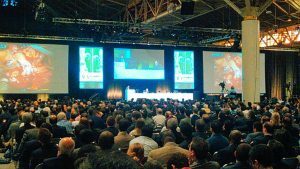 We provided transportable downlink services in Vancouver, British Columbia for the annual meeting of the AAGL organization. 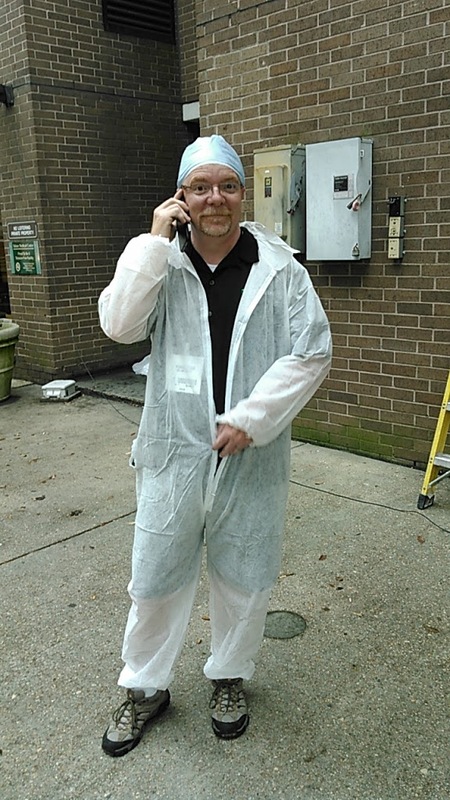 We arranged the transmission facilities at two hospitals in the United States and performed quality control on the live feeds. 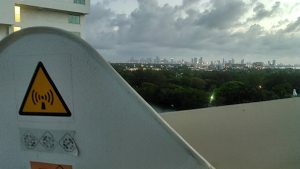 This location was a challenge because tall buildings limited us to edge of the arc satellites, low on the horizon. 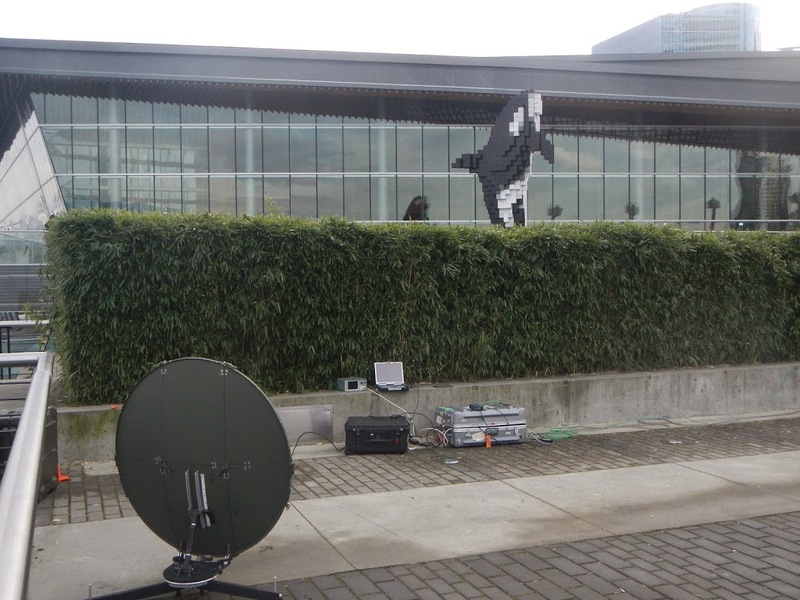 This resulted in some adjacent satellite interference because of the 1.1m portable antenna, which is more suited for transmitting than receiving. 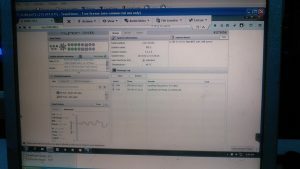 But we had expected this and planned ahead- purchasing more bandwidth than would normally be used so we could switch to lower-complexity modulation and overcome the noise issues. 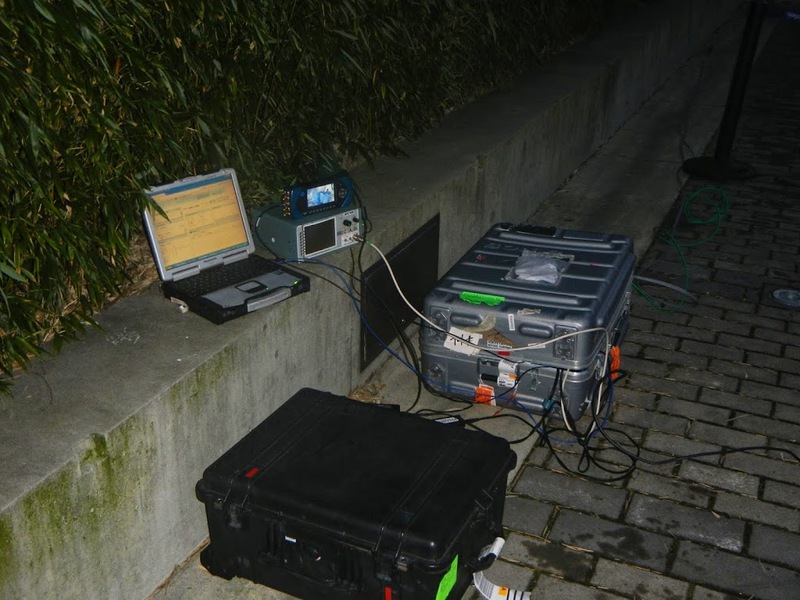 The Ateme receivers we brought provided a real-time signal quality graph which assisted in aiming the dish beyond the limits of the portable spectrum analyzer to get optimum signal quality. The location itself was great- in the shadow of the Vancouver Olympic Torch on one side, and seaplanes landing and taking off on the other side. Thankfully, Vancouver’s persistent rainy weather held off for our event. 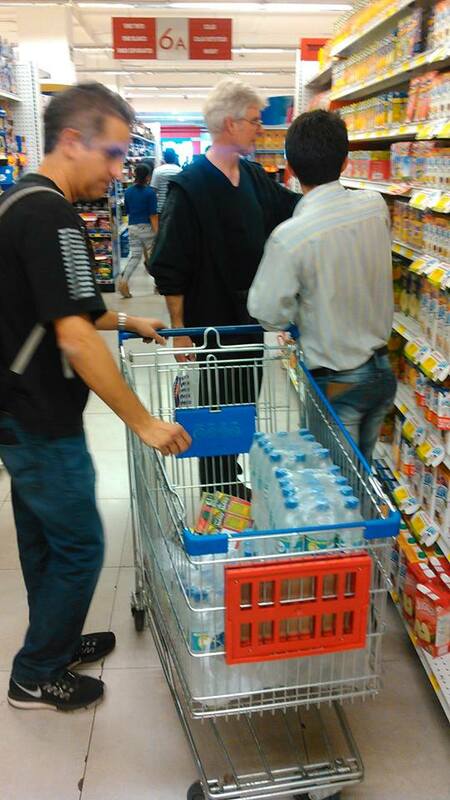 More. 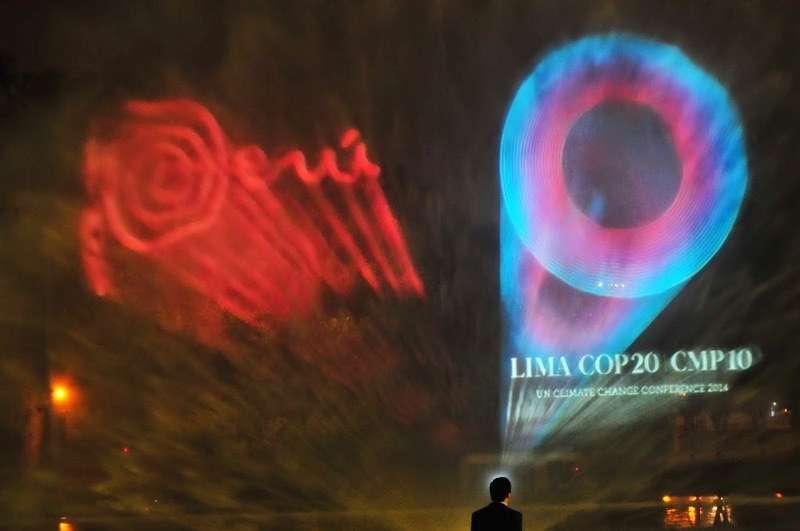 We returned to Lima, Peru for the first time in over 20 years to cover the UN COP20, an annual followup to the Kyoto Protocol climate change meetings. 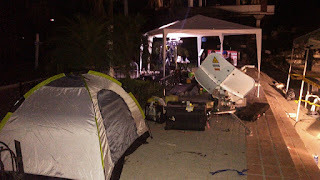 This is our second COP event, having covered one held in Cancun a few years before. This was also the second deployment for our new flyaway dish, and it worked flawlessly. 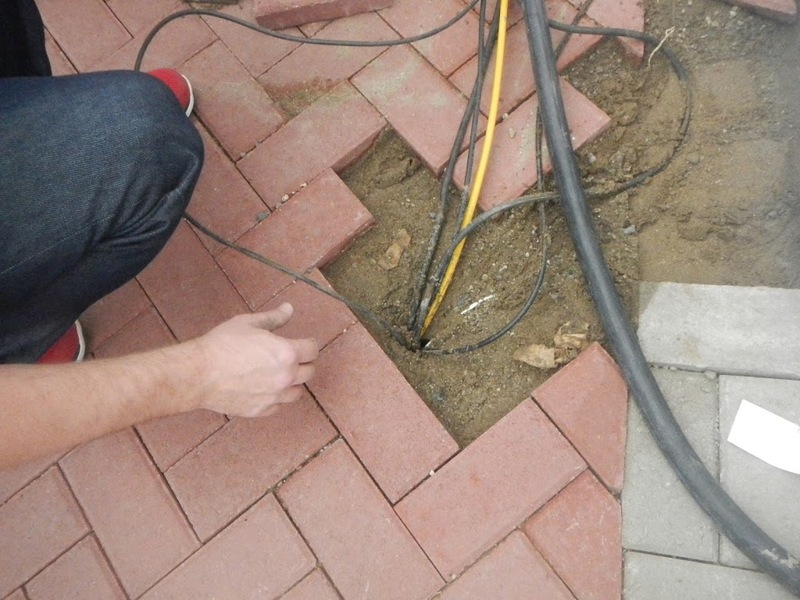 The biggest difficulty was the setup and breakdown, after the event staff tried to cement our cables into place and laid a brick walkway over them. 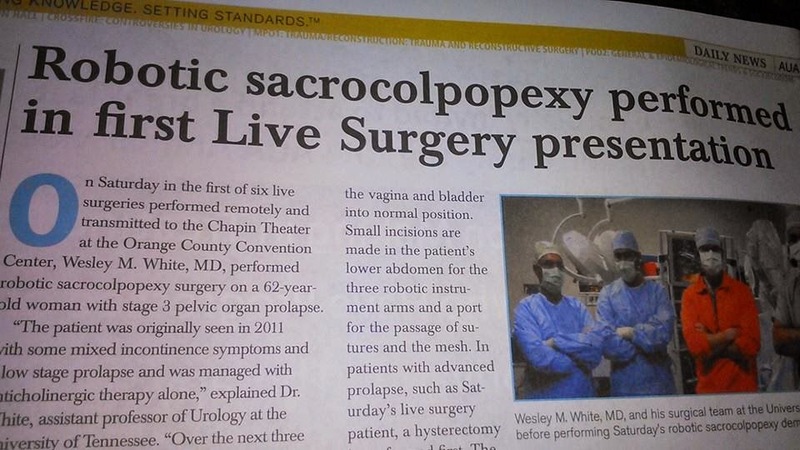 More here. 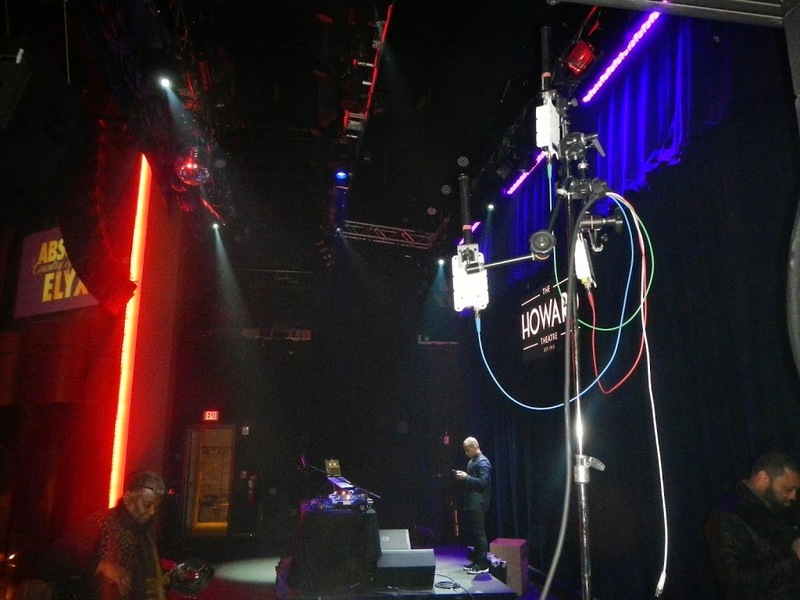 We finished up the year with some more live TV, using our camera-back microwave system to cover a New Year’s Eve party at DC’s famous Howard Theater. 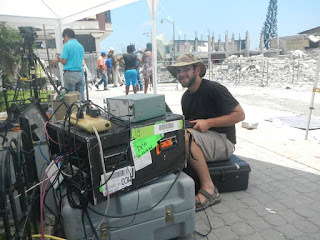 A HD microwave receiver with diversity antennas spread around back stage allowed our camera to roam freely throughout the venue, even go live from the street outside of the theater- all completely wireless to the uplink truck! We are looking forward to another great year in 2015!